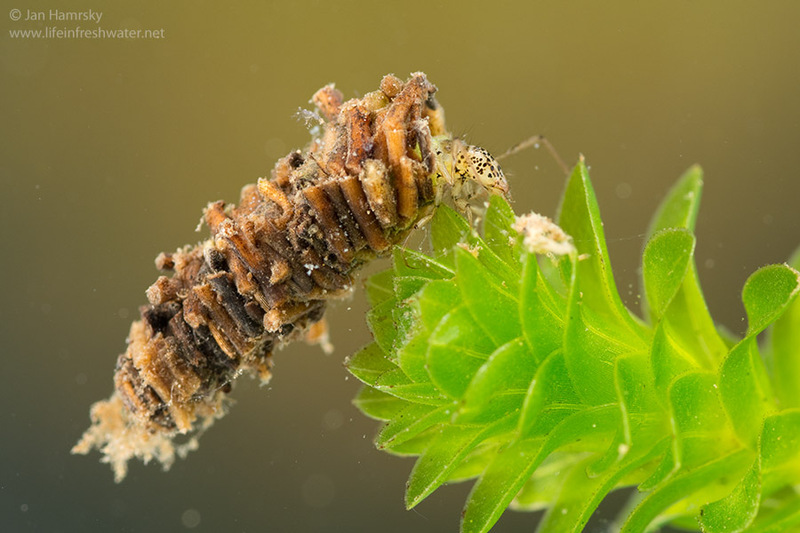 Shredders/scrapers/collectors – larvae mostly feed on periphyton (layer of algae and associated flora and fauna) and pieces of both aquatic and terrestrial vegetation. 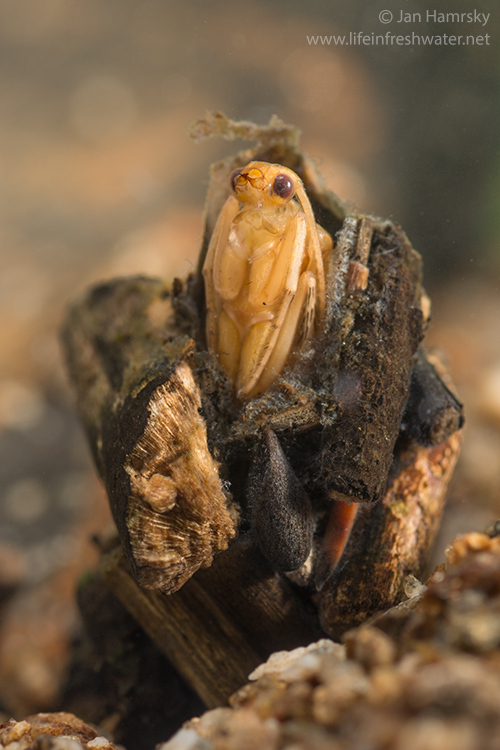 Case-building larvae can be found in variety of ecosystems from small ponds and streams to large lakes and rivers. 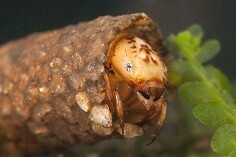 Climbers or crawlers resembling hermit crabs. 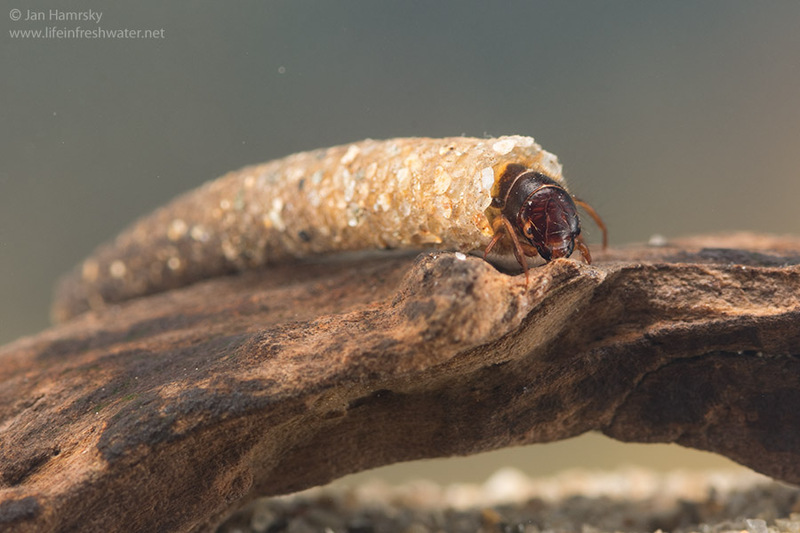 Some small species are able to swim. 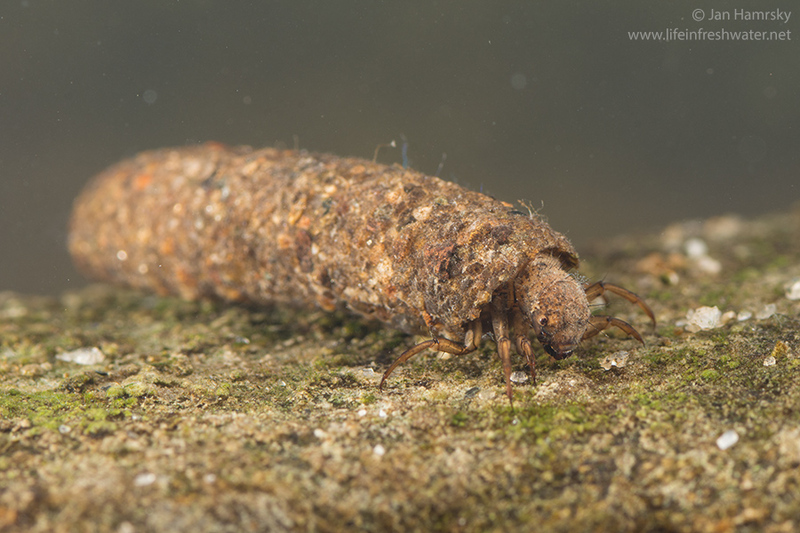 The size of caddisfly larvae varies from 3 mm to approximately 40 mm (cases of some large species can reach sizes around 60 mm). 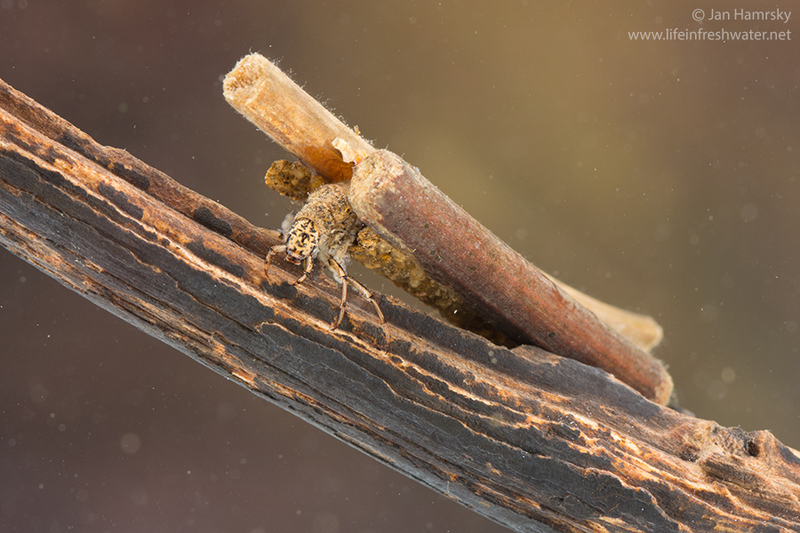 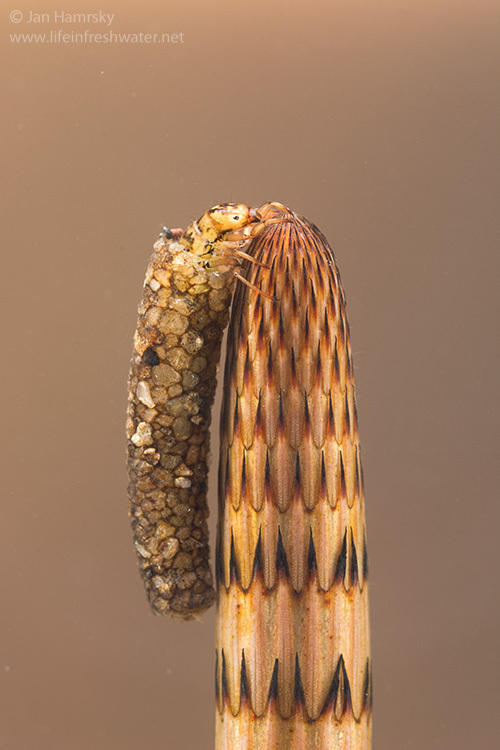 Caddisflies undergo complete metamorphosis. 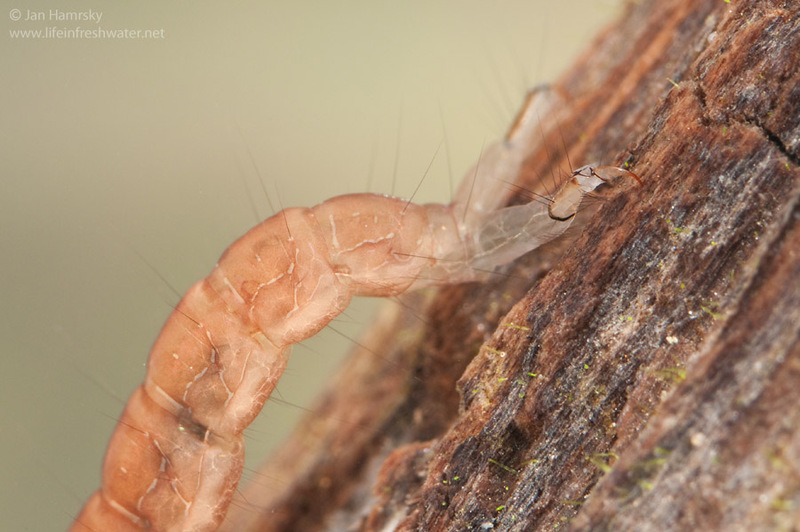 Their life cycle includes four stages – egg, larva, pupa and adult. 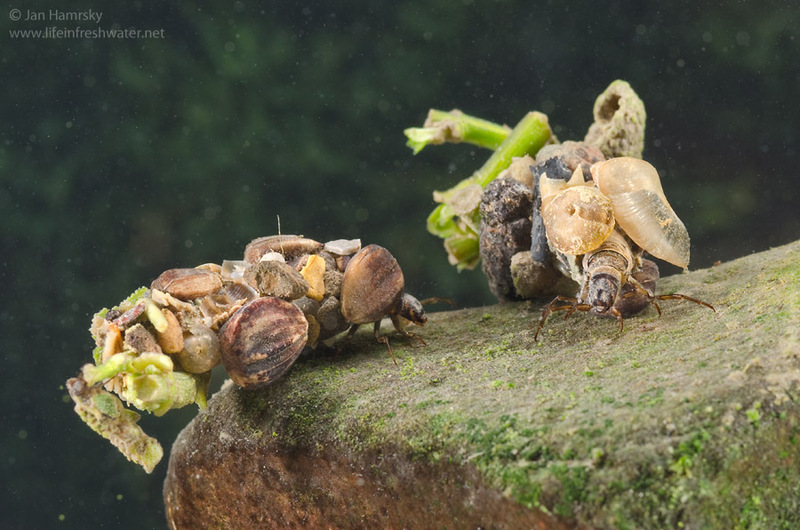 Most species produce one generation per year. 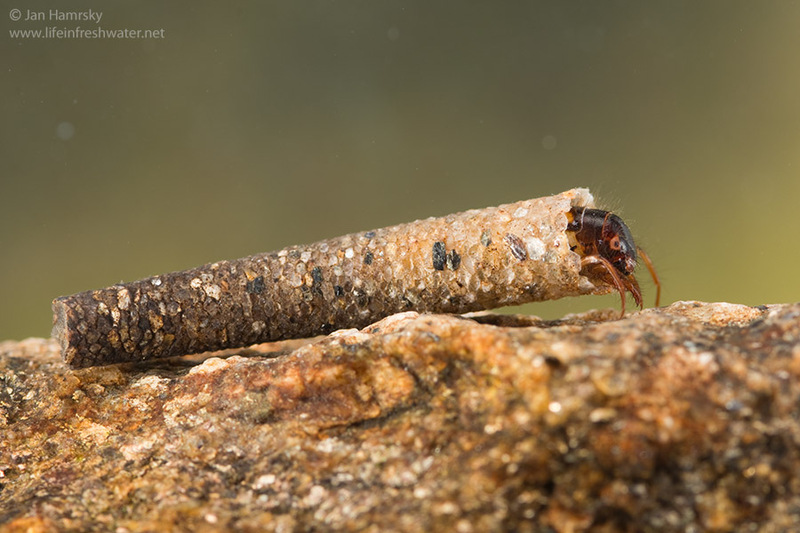 Caddisflies, inconspicuous brown to gray insects, are the ecologically diverse and important group of insects. 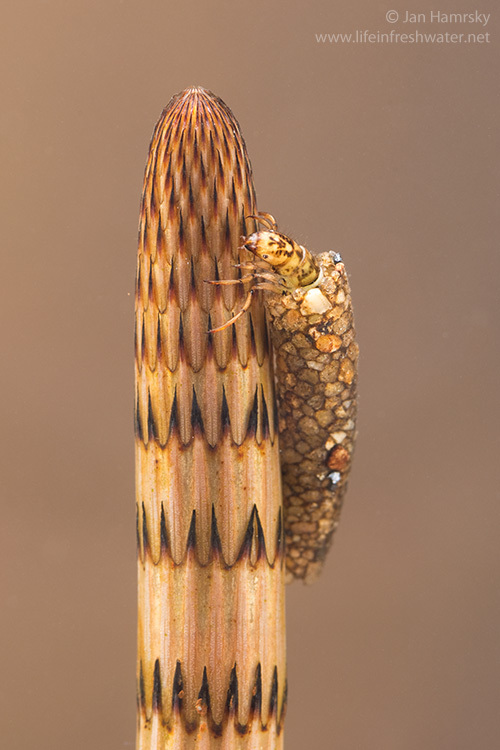 Caddisflies are closely related to moths (order Lepidoptera), which they are often mistaken for. 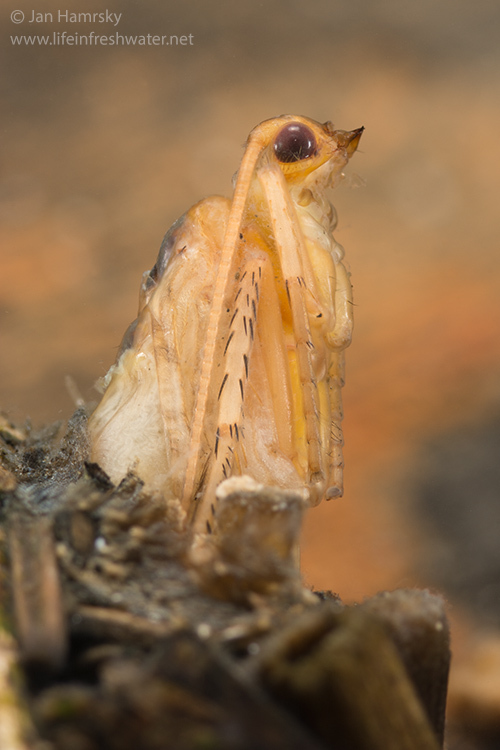 As like in moths, caddisflies are active at night and attracted to light (representing important food source for bats). 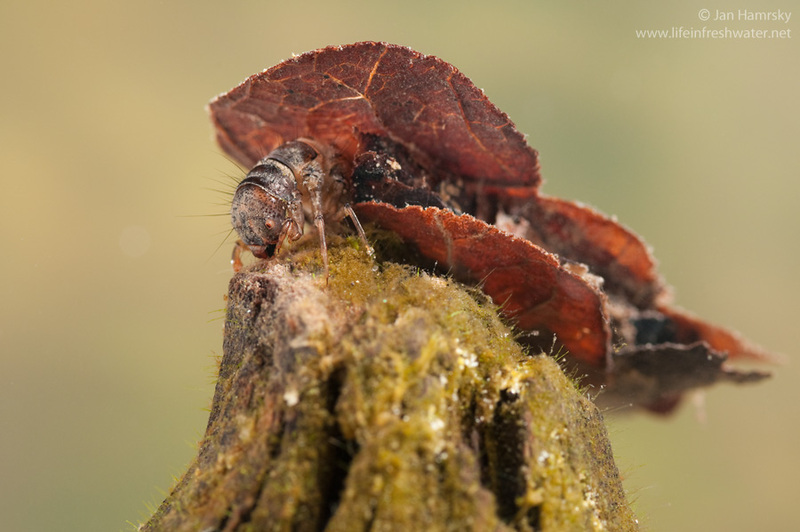 Their wings are covered with hairs instead of scales, as like in moths. 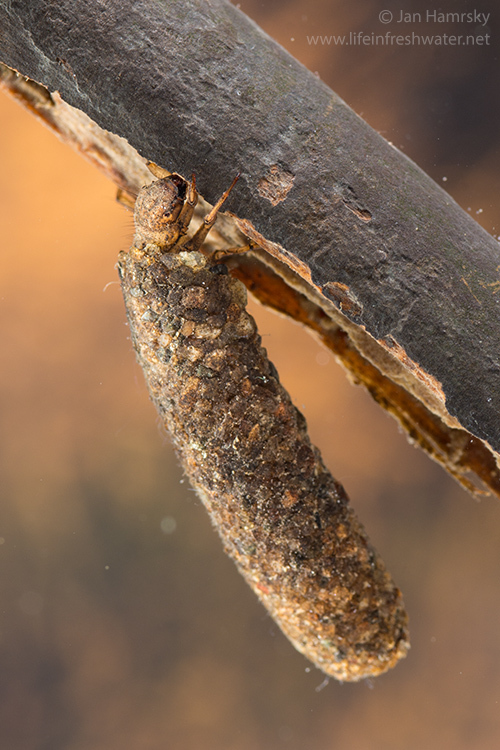 The mouthparts are paired and straight, while moths have a long and coiled tube (proboscis). 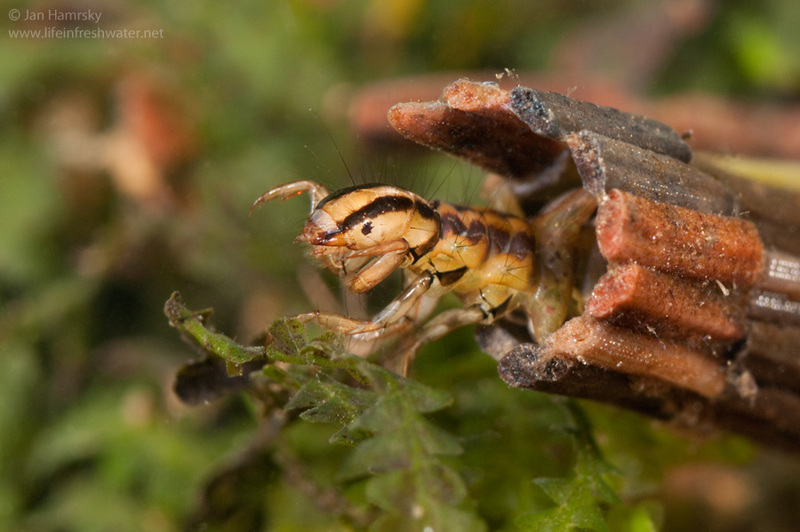 Adults live for about one month and feed on nectar absorbed by simple mouthparts. 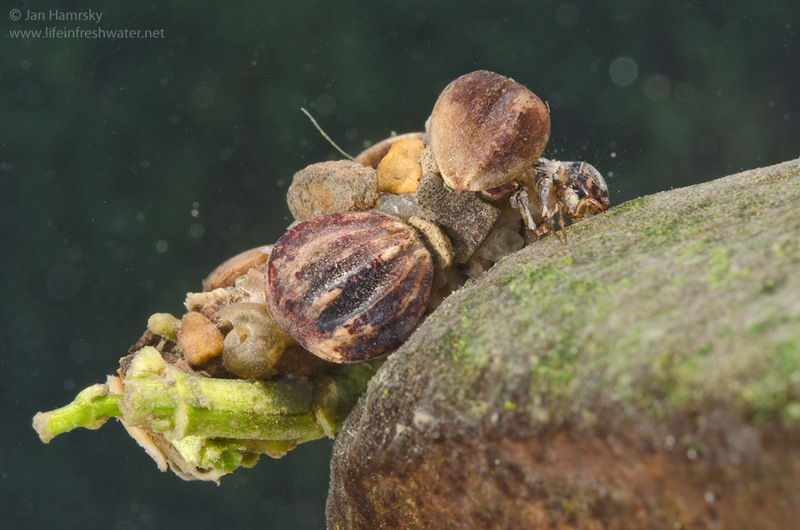 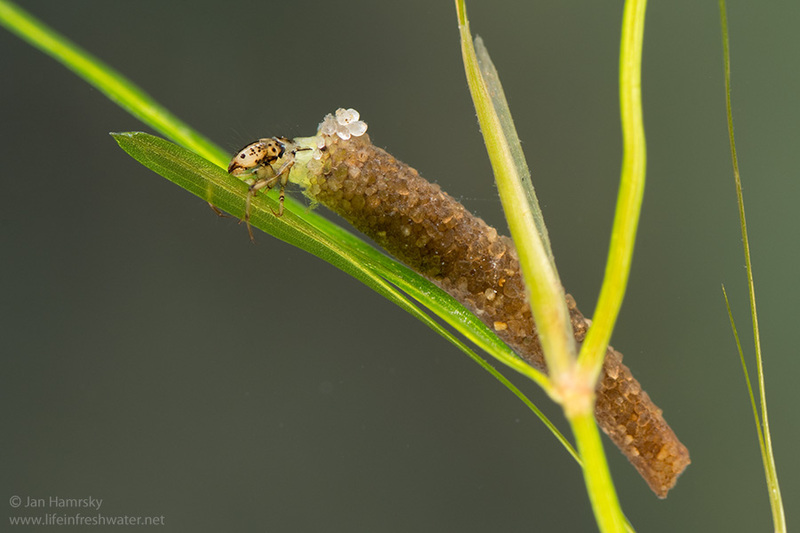 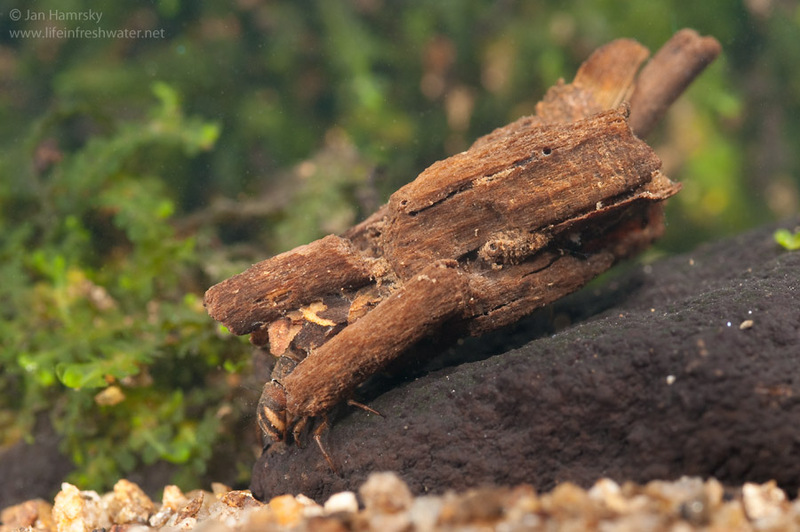 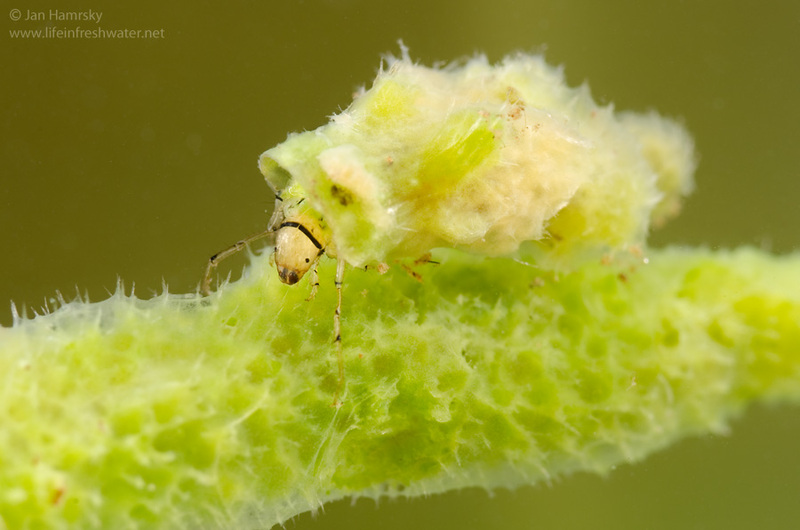 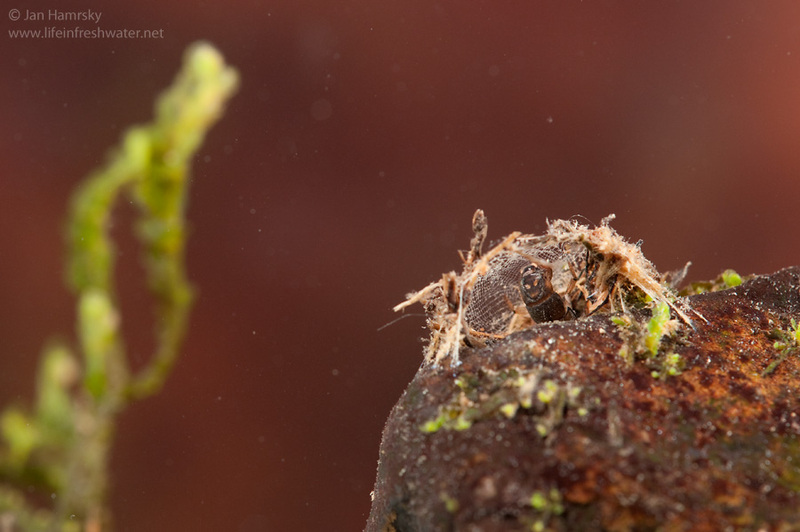 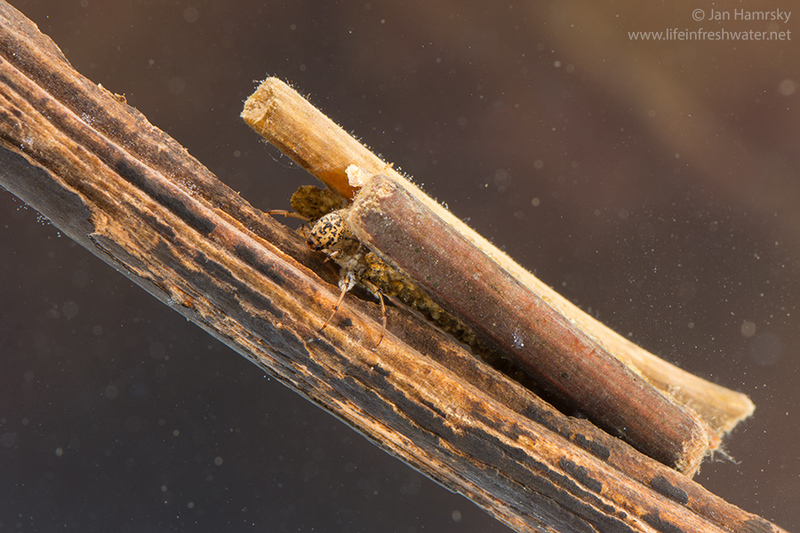 Female caddisflies lay masses of eggs on vegetation just above the water surface. 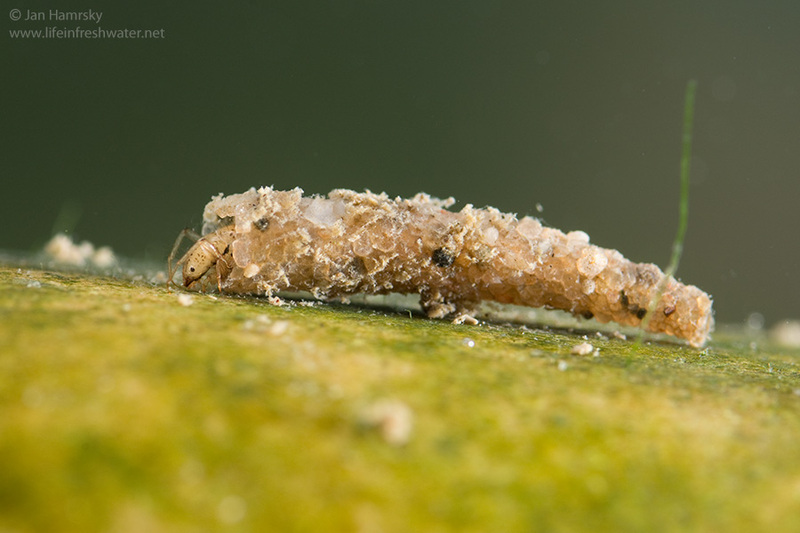 When the larvae hatch from the eggs, they fall into water and immediately start to build protective cases. 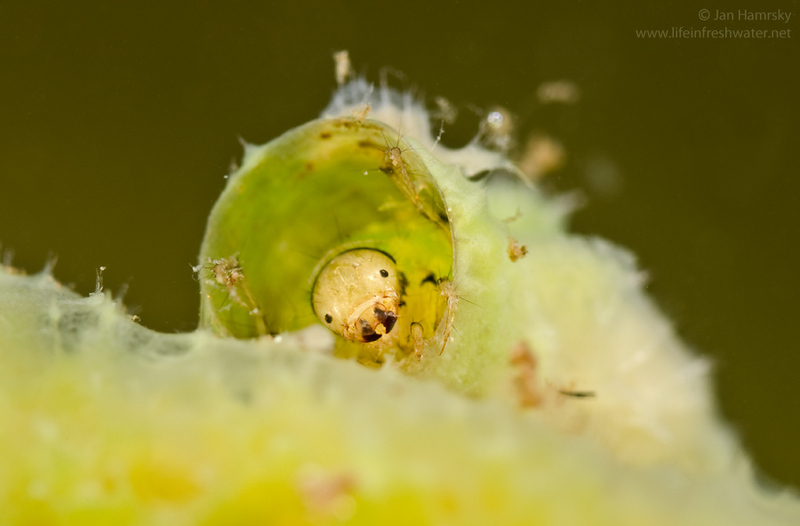 When the larva is fully grown, it enters the pupal phase. 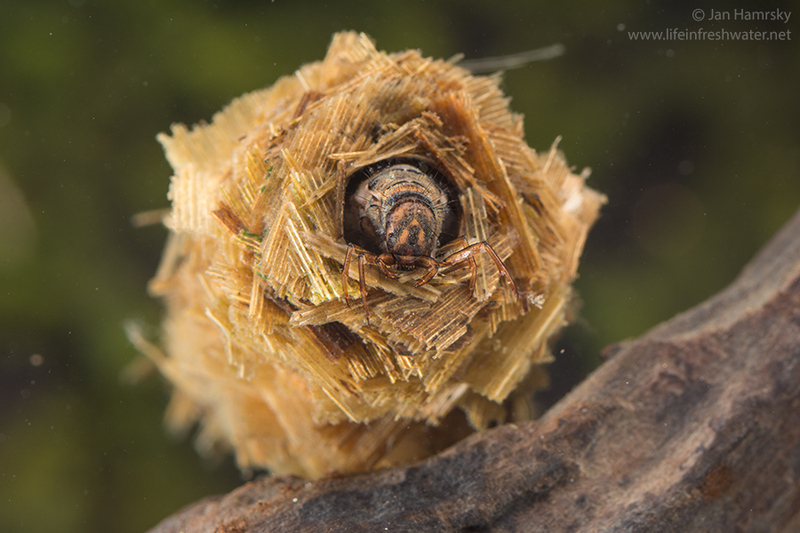 The larva attaches the case to some solid object, as like stone or a larger piece of submerged wood, and seals the opening. 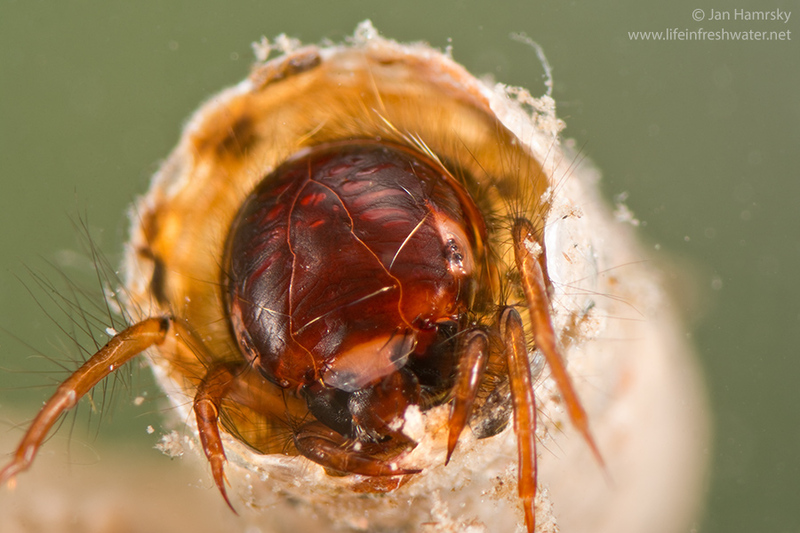 Subsequently creates the cocoon of silk around the body. 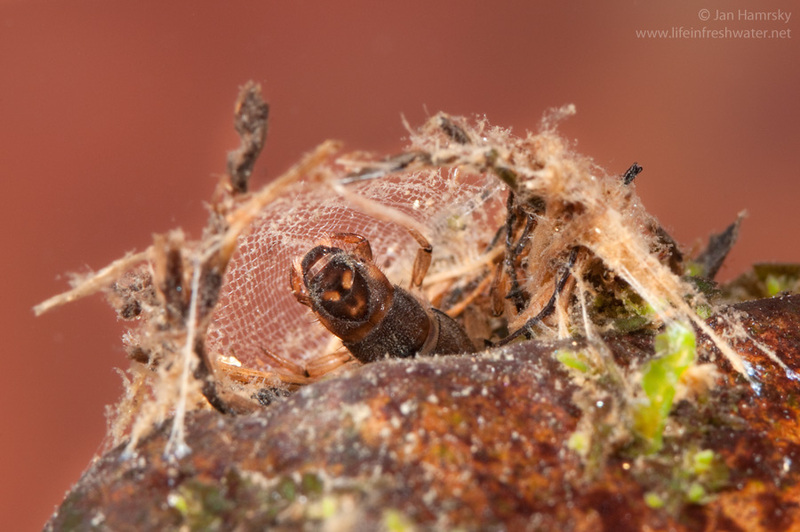 Pupal cases can be perforated and thus water permeable. 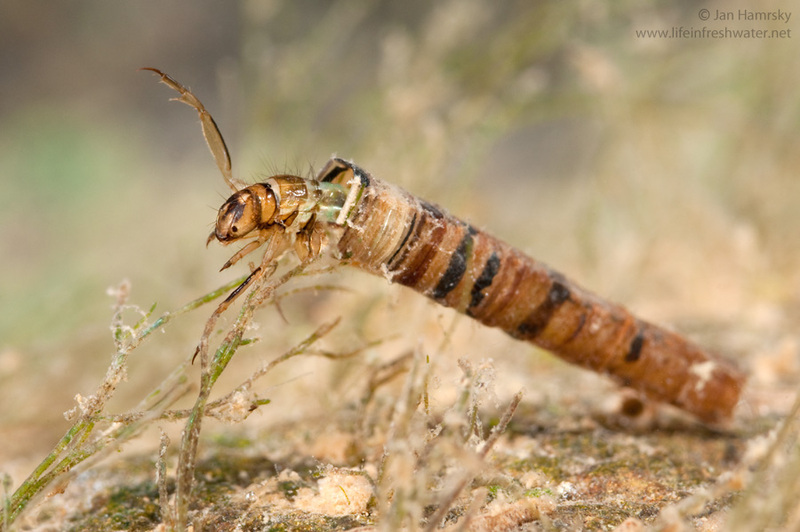 Moreover, insects undergoing transformation inside the case undulate, in order to create flow of oxygenated water around the body. 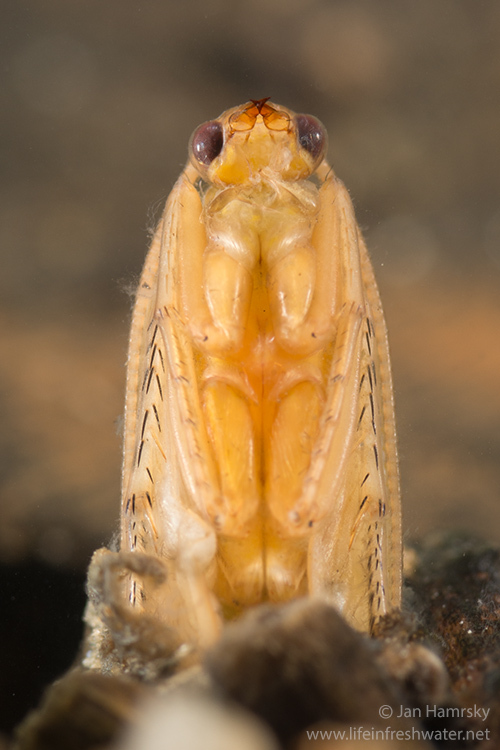 All members of the order Trichoptera are aquatic as in the stages of larvae and pupae, while adults are terrestrial. 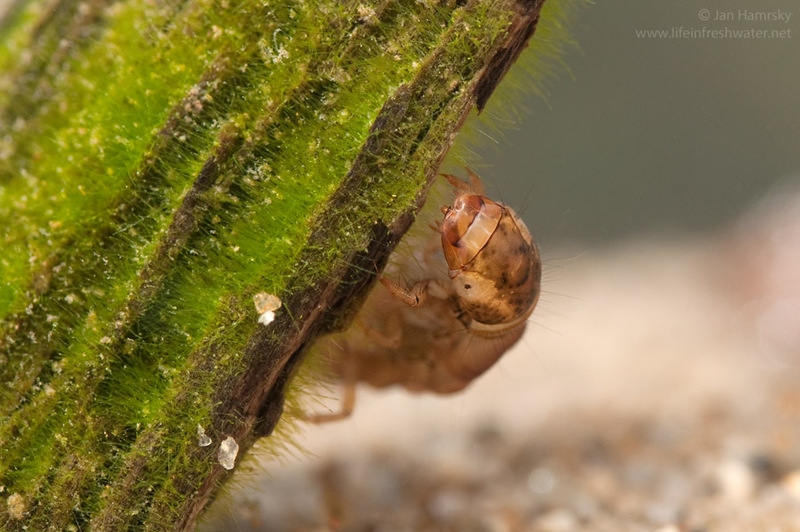 Some species are still known only as adults, while their larval stages have not been described yet. 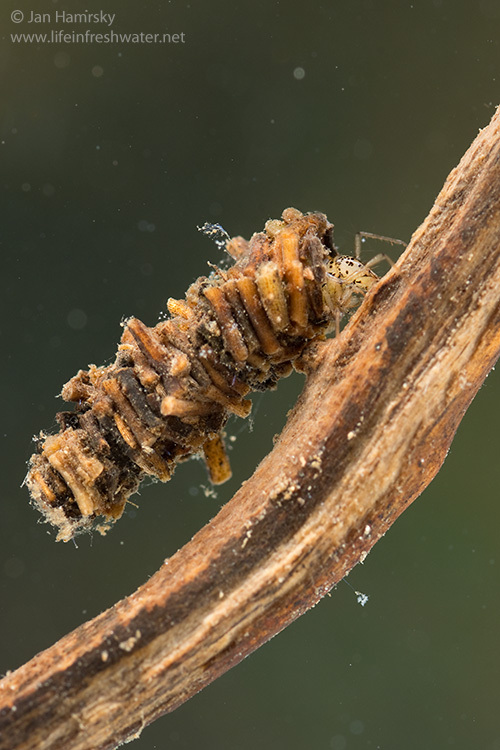 Case-building larvae are the most diverse and abundant group, living in both running and still waters. 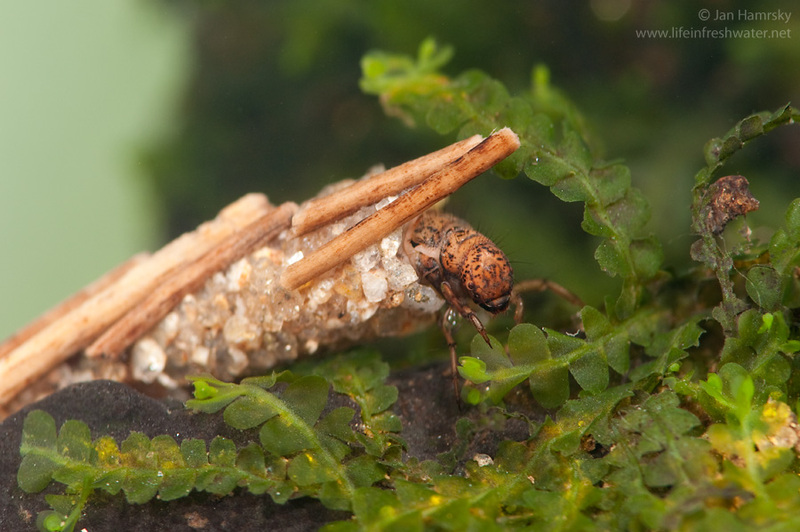 Caddisfly larvae have elongated bodies resembling caterpillars of moths and butterflies (similarity as between adults). 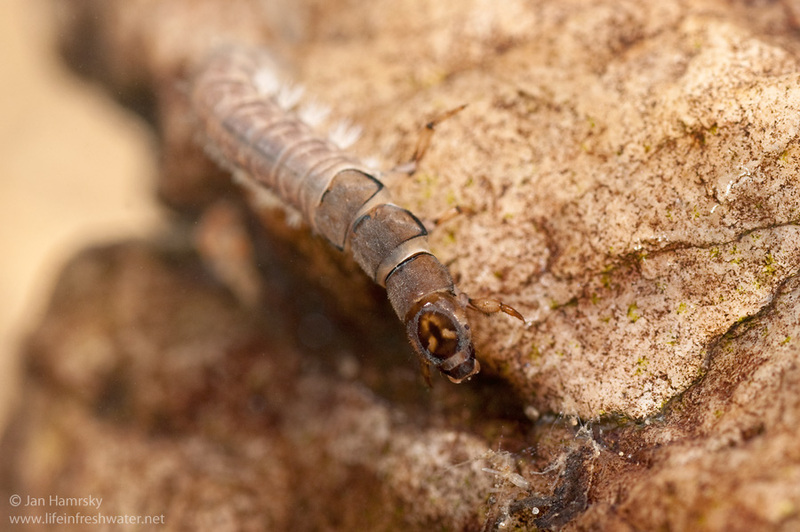 Larvae have always a hardened (sclerotized) head and first thoracic segment, while the abdomen remains pale and soft. 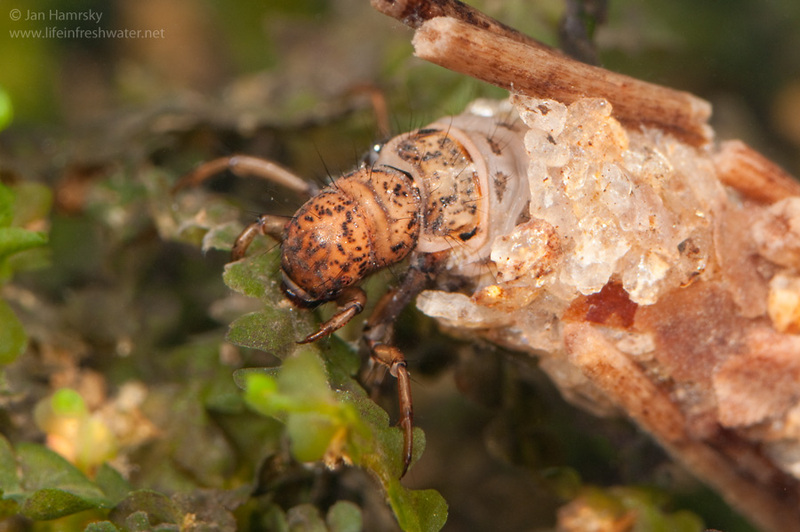 Second and third thoracic segments can be covered with hardened chitinous plates as well. 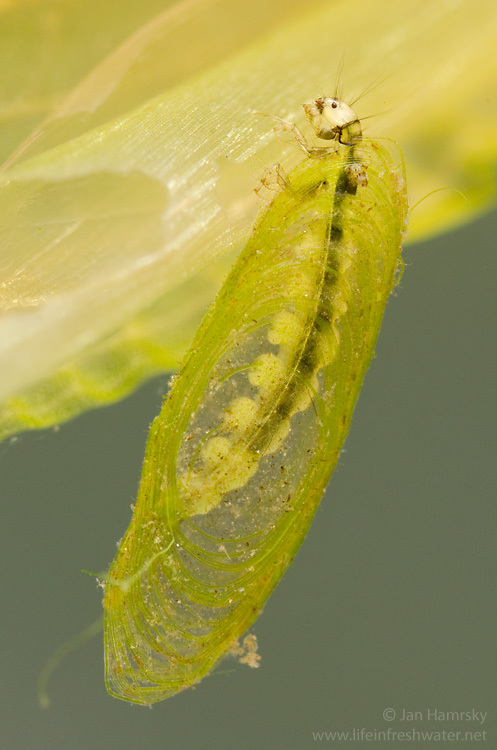 Position and size of the plates are often important identification features among the species. 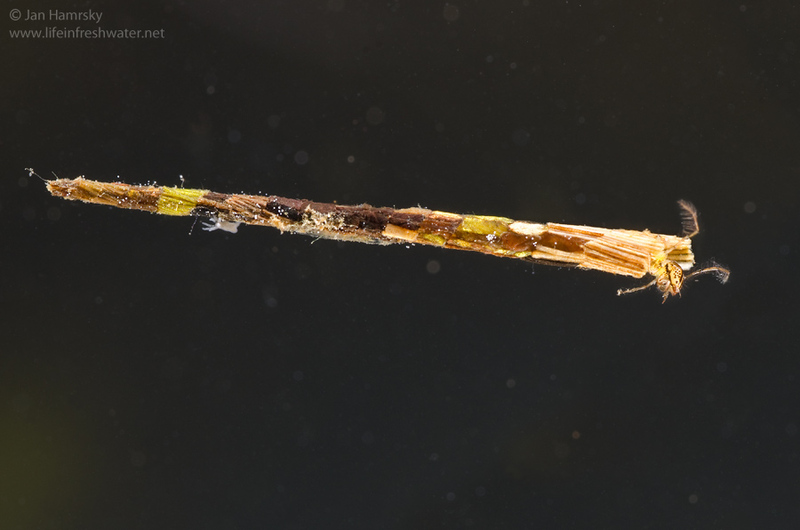 Pair of segmented legs extends from each thoracic segment. 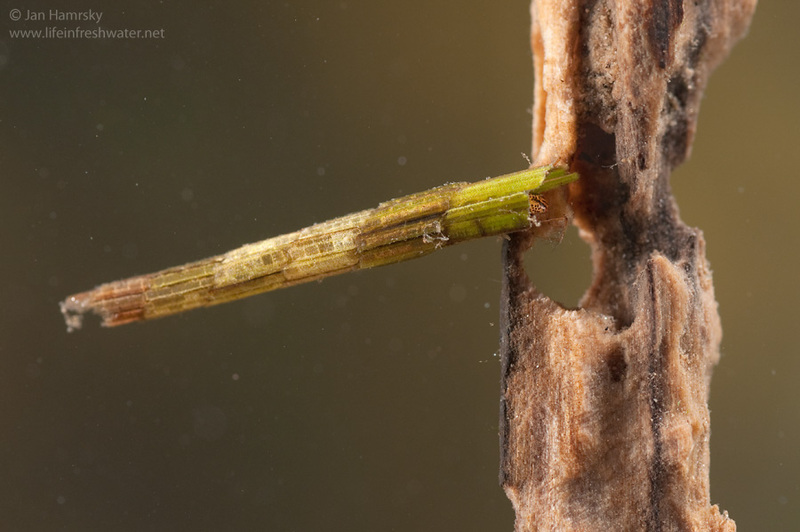 Legs can have modifications as like sharp endings, hooks, or rows of setae. 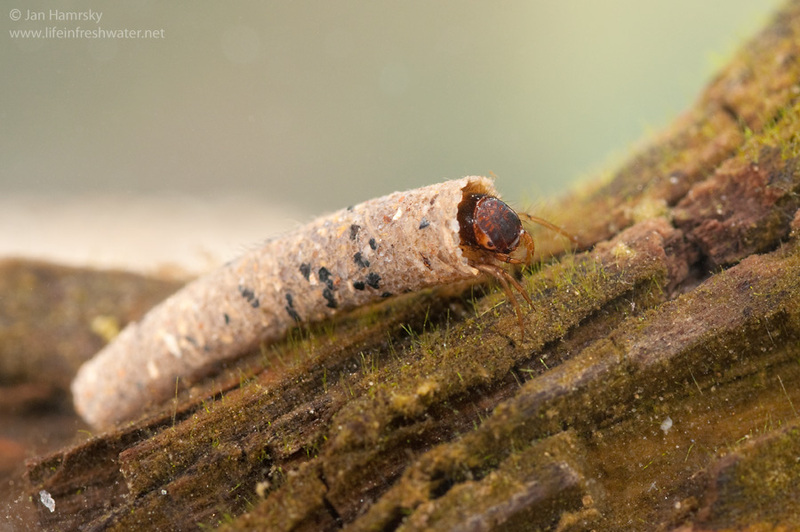 Their purpose is to help the larvae in movement, building the shelter, or collecting food. 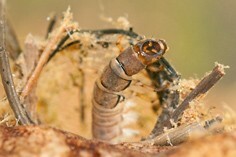 Abdomen terminates with a pair of prolegs equipped with claws. 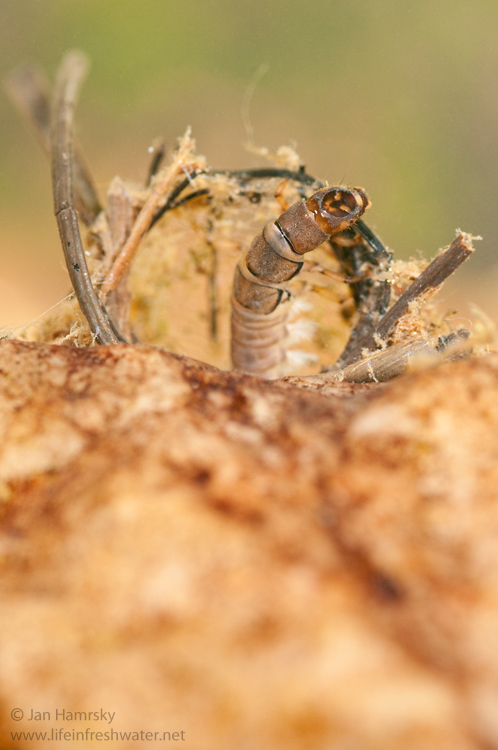 They are used to anchor the larvae in the case. 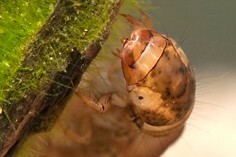 Eyes are small and simple. 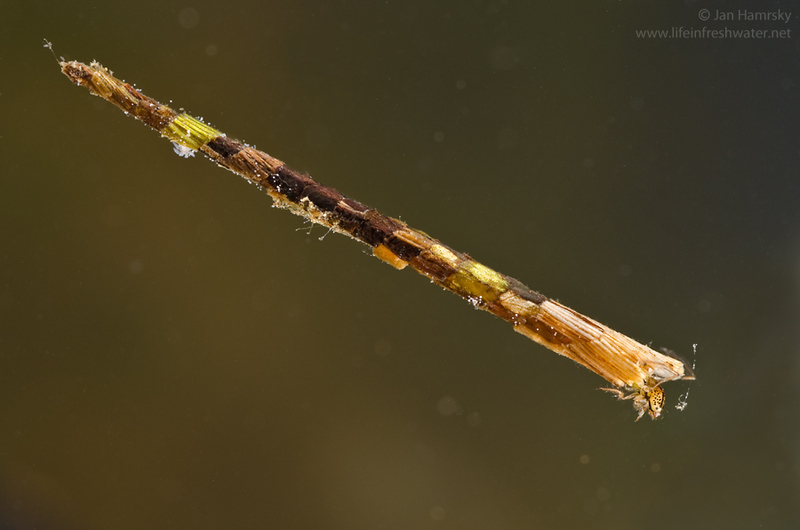 Antennae are very small and can be seen only when using high magnification. 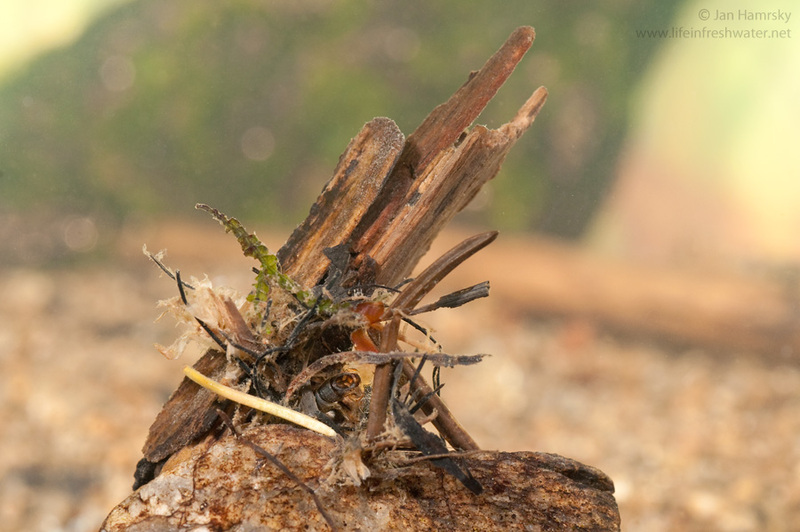 Continually submerged stones and pieces of wood provide the best substrate for growth of algae and periphyton, which the larvae effectively scrap. 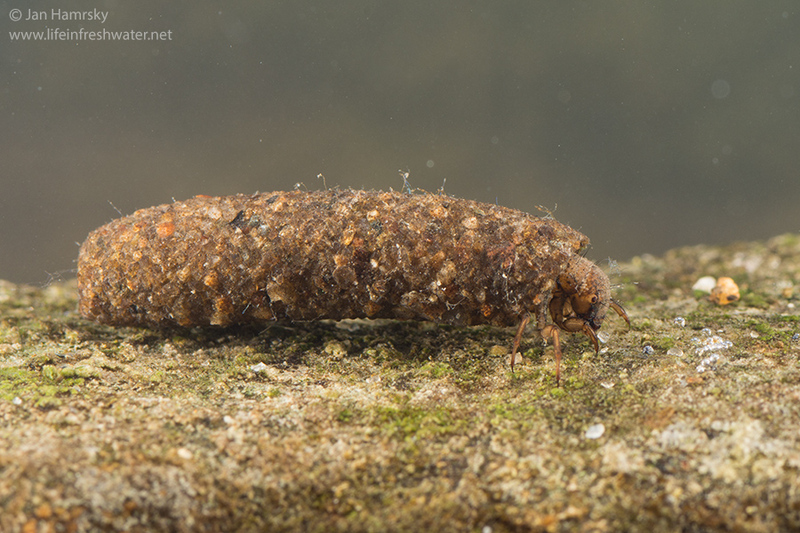 As they graze, caddisfly larvae may consume a significant portion of the available algae in the stream. 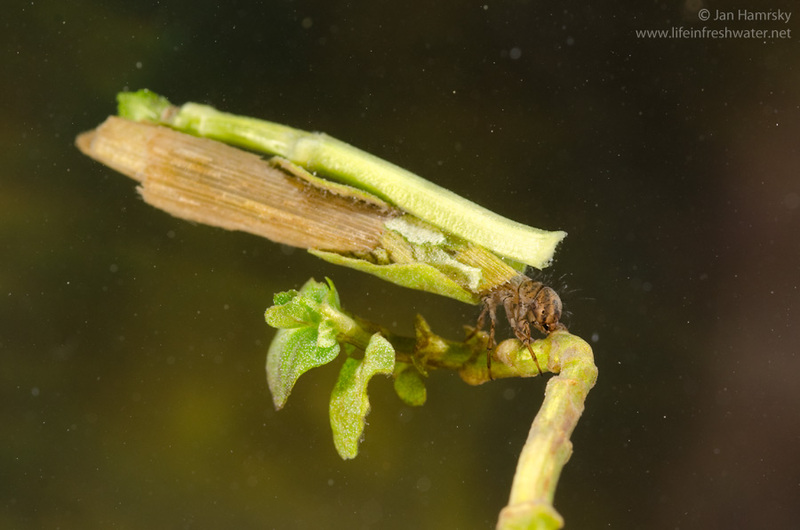 Some species with large mouthparts shred leaves of terrestrial plants fallen into the water. 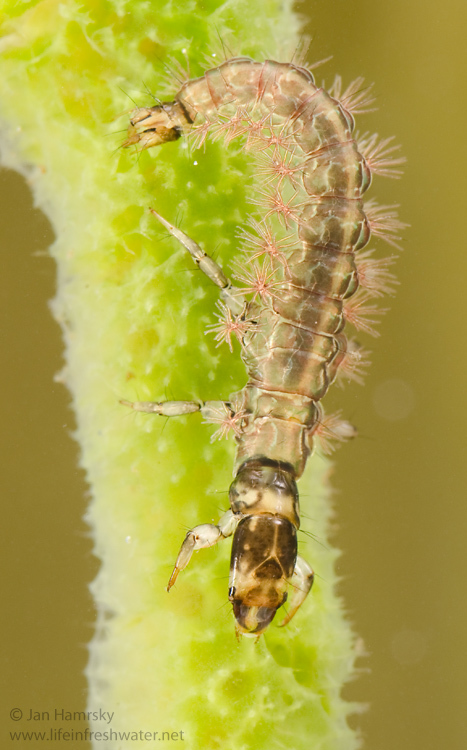 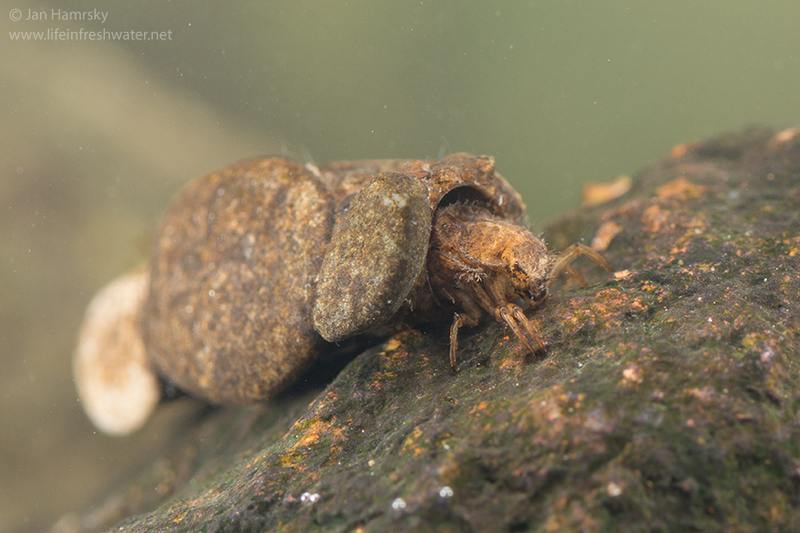 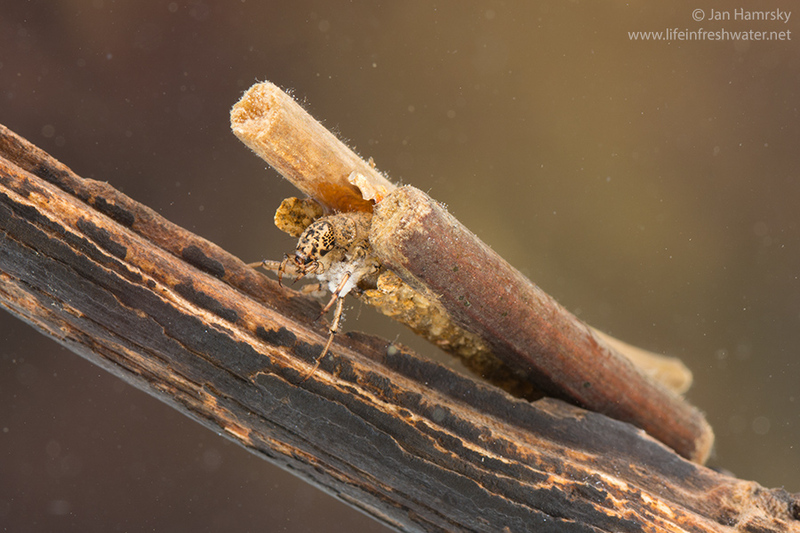 Caddisfly larvae obtain oxygen dissolved in water through thin and soft skin. 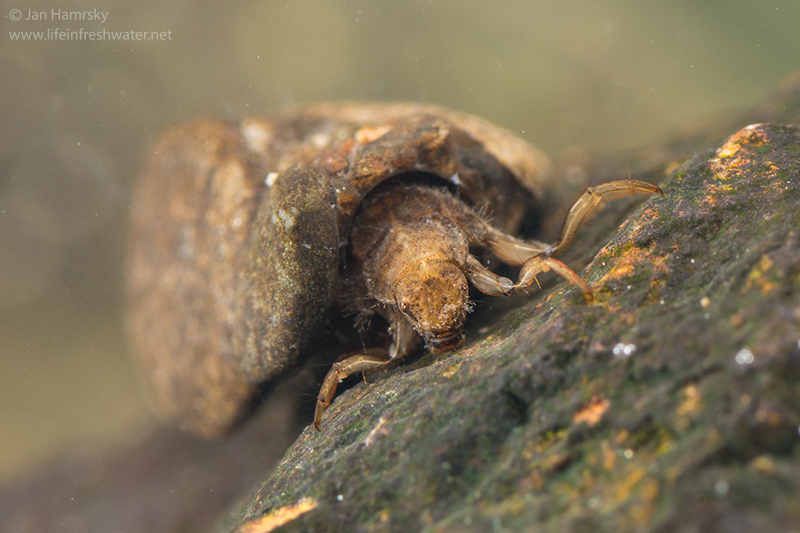 Some species have branched gills or humps on the sides of the body (in order to increase the body surface). 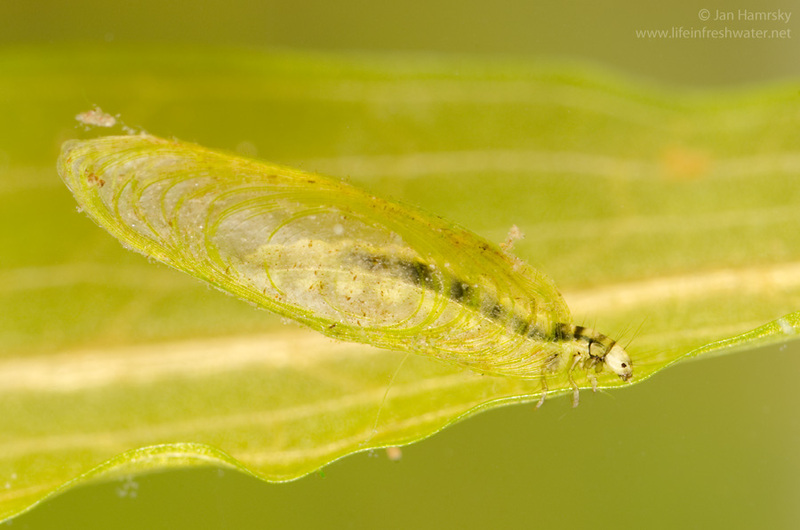 Larvae undulate their body to create a flow of oxygenated water through the case. 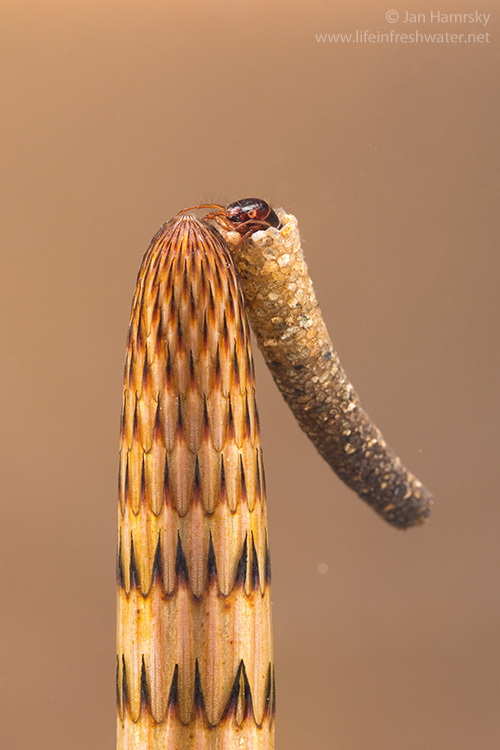 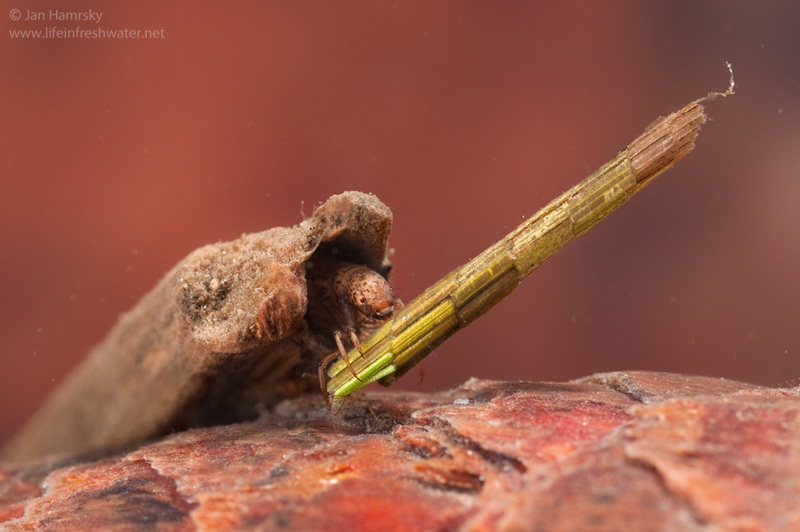 The major reason making caddisflies so successful and widespread is their ability to produce a silken thread. 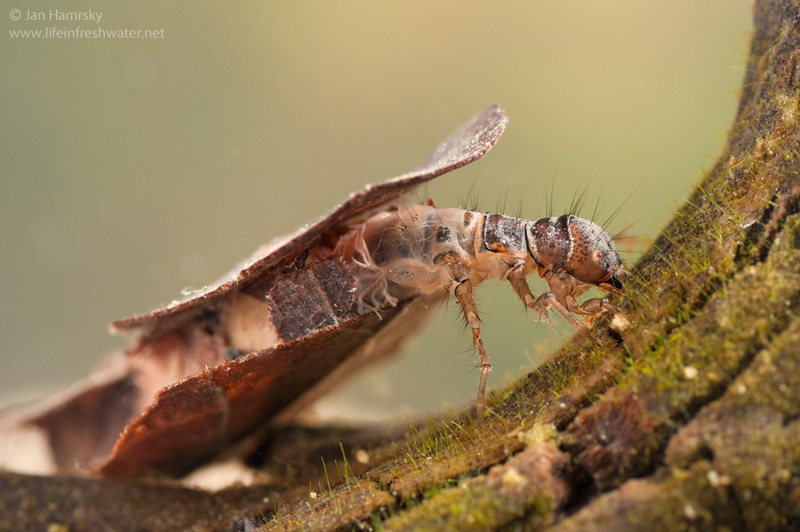 It is spun by glands placed on the labium (the same part of the head as dragonflies modified into hunting mask). 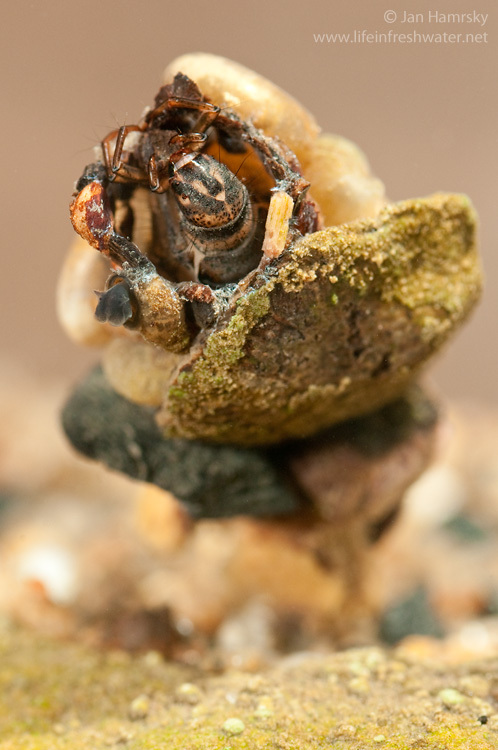 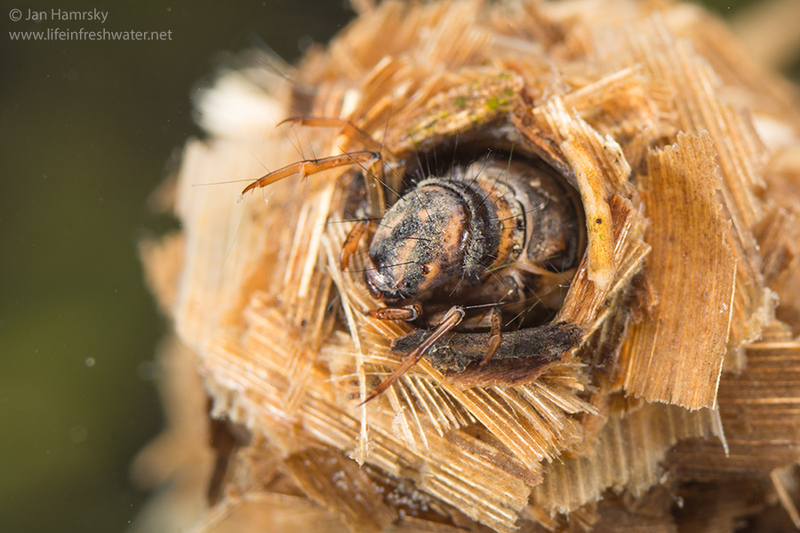 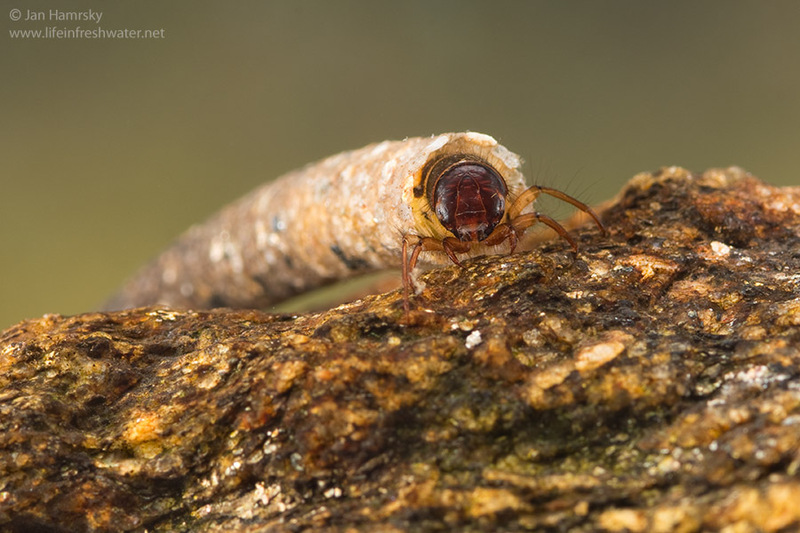 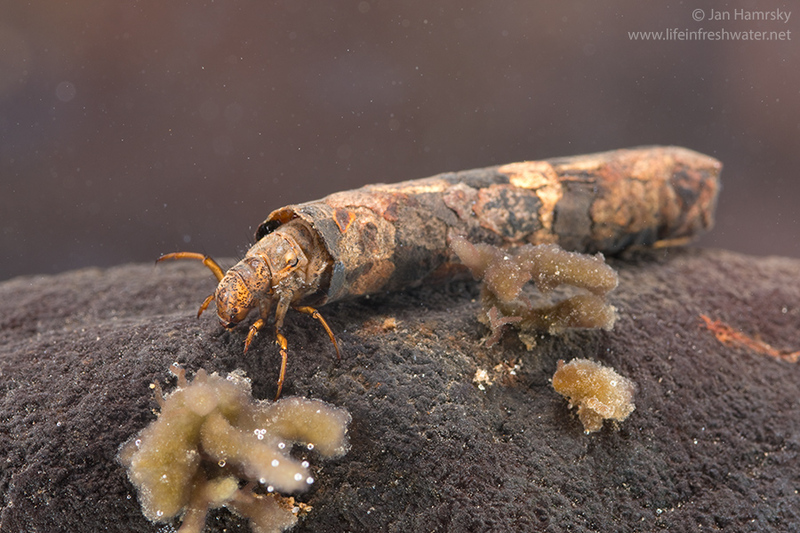 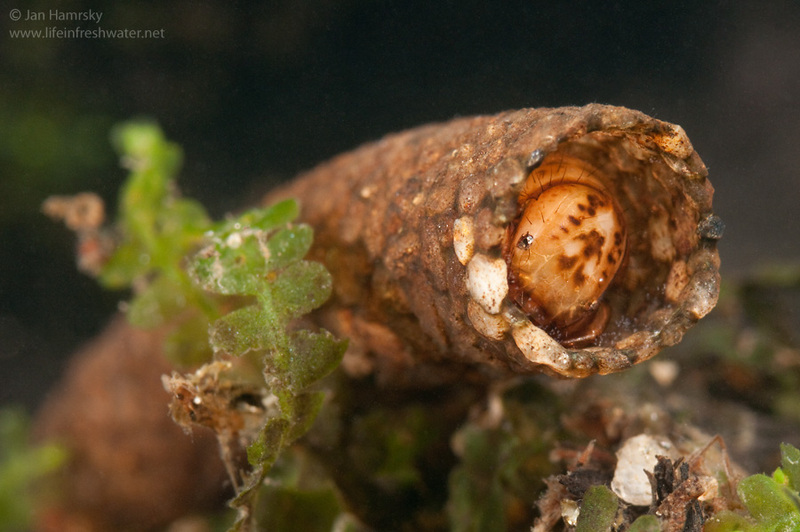 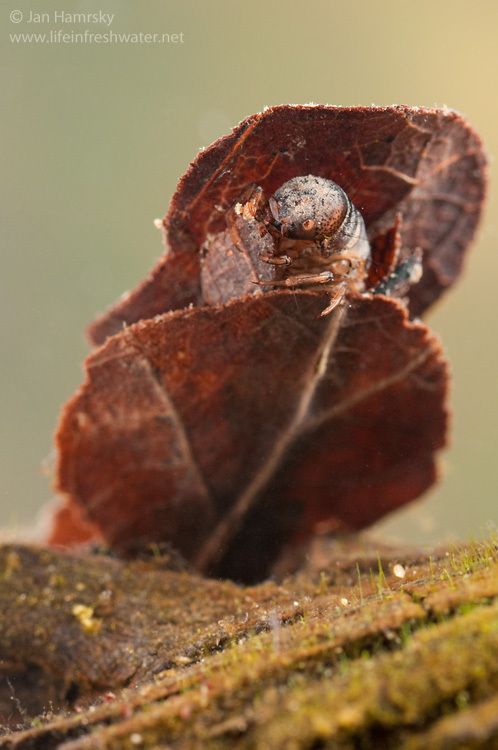 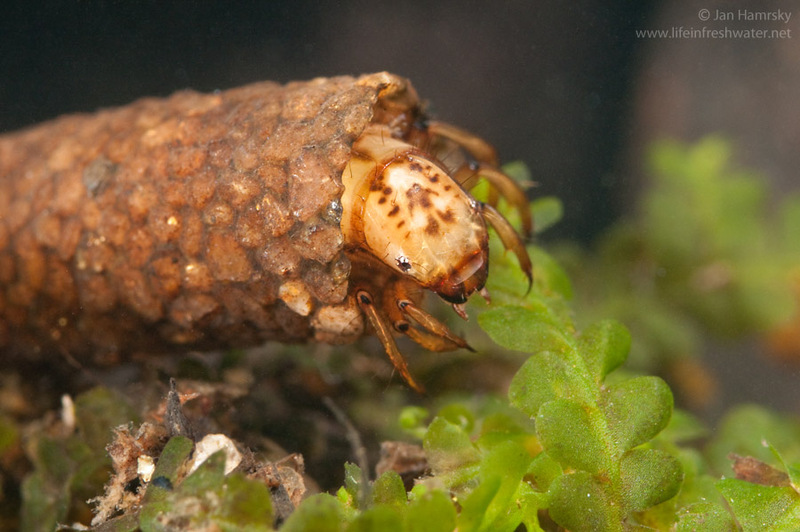 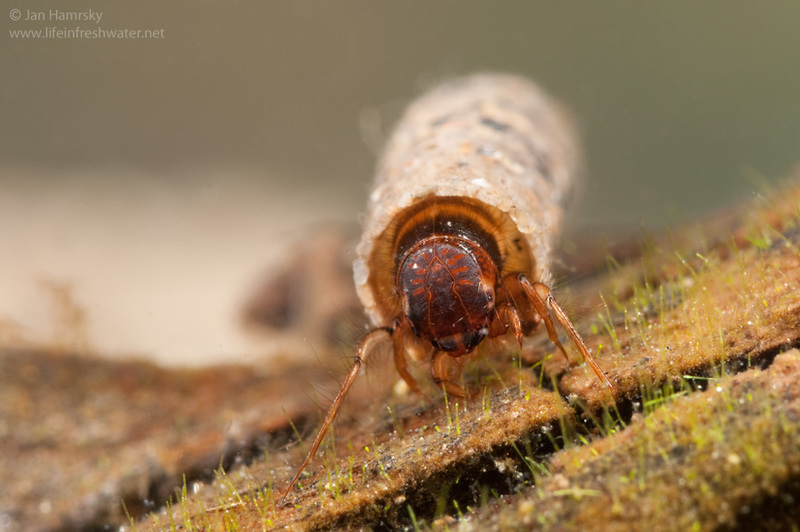 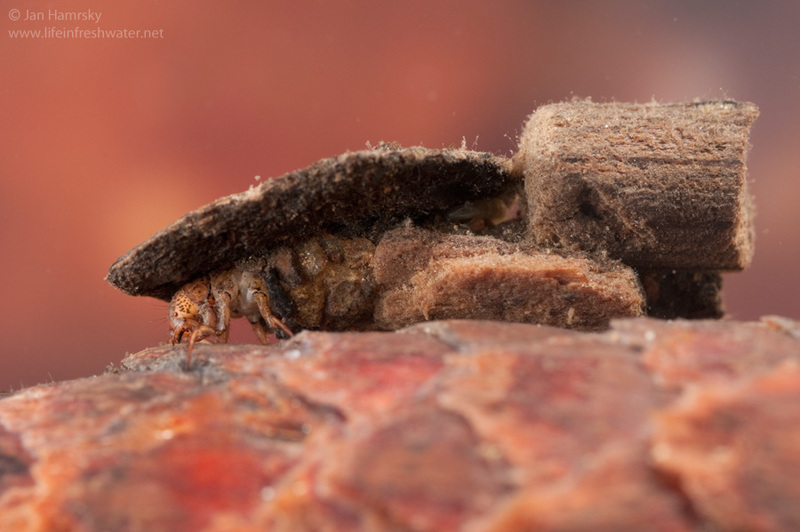 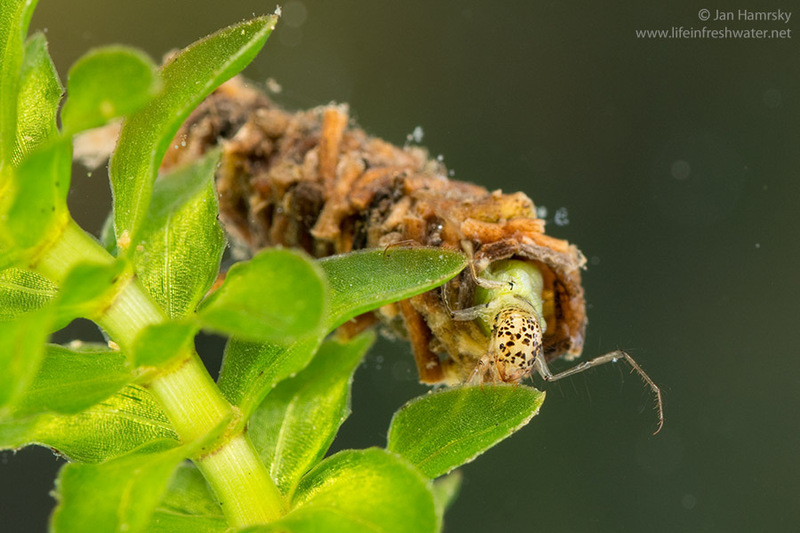 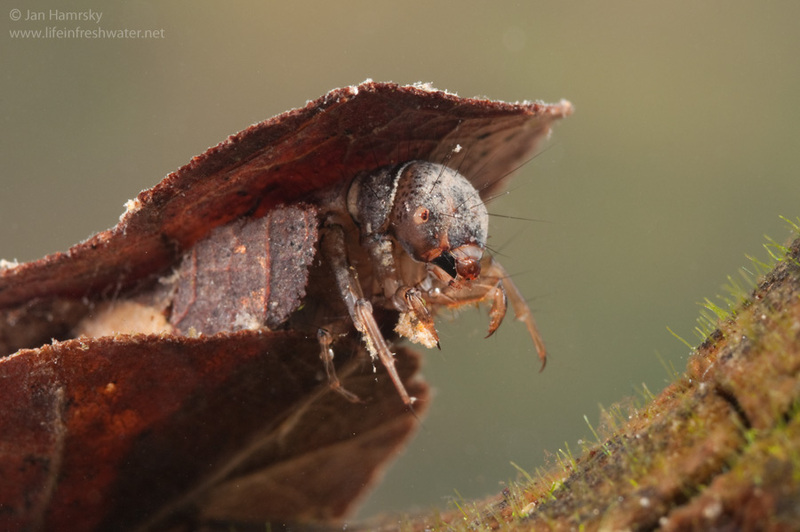 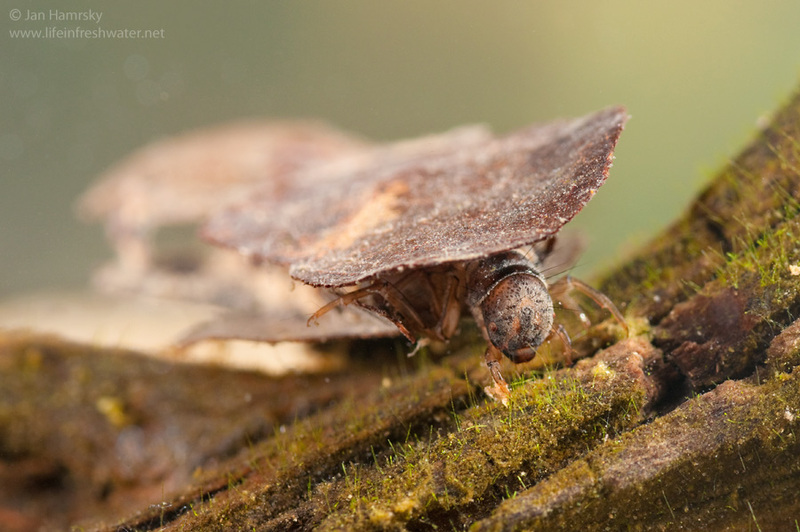 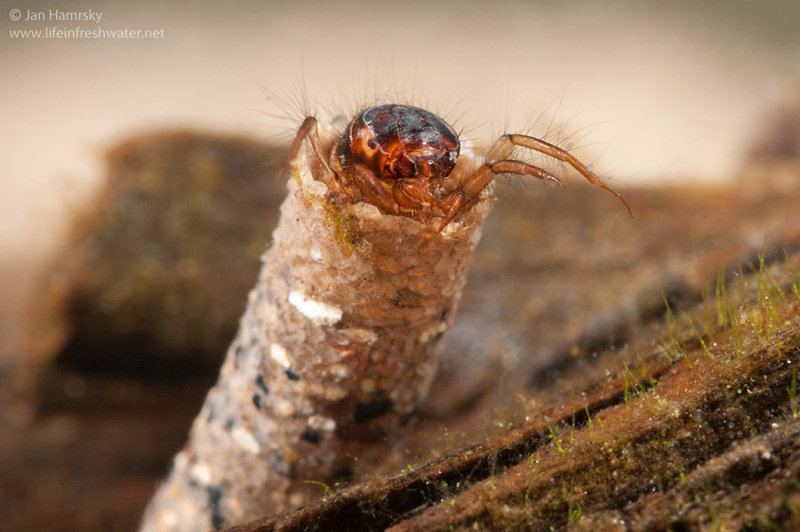 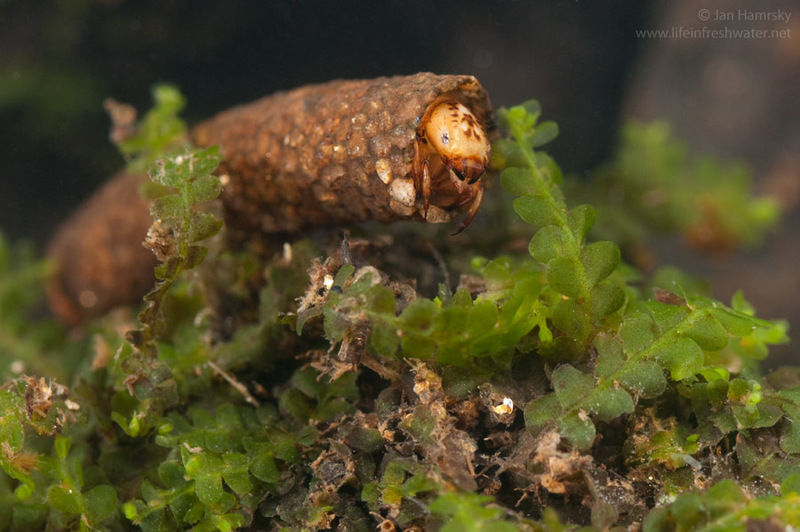 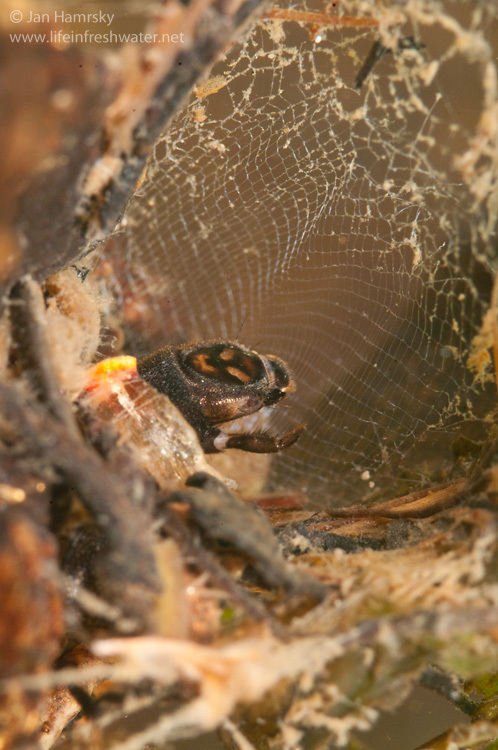 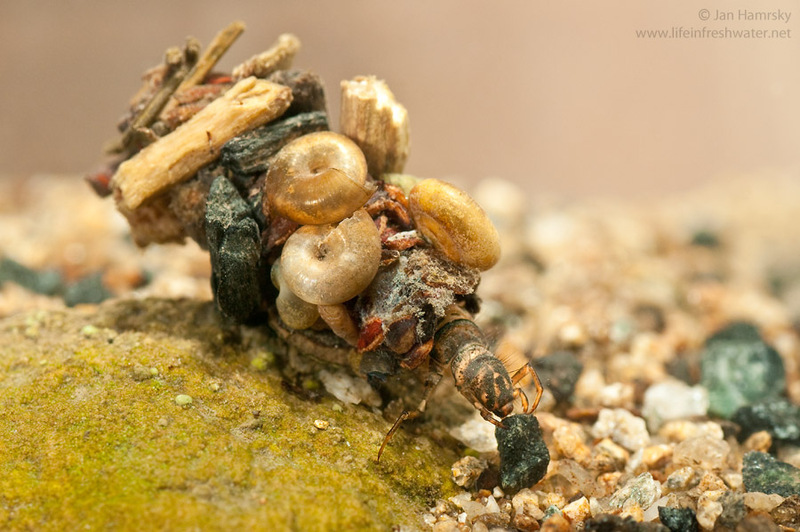 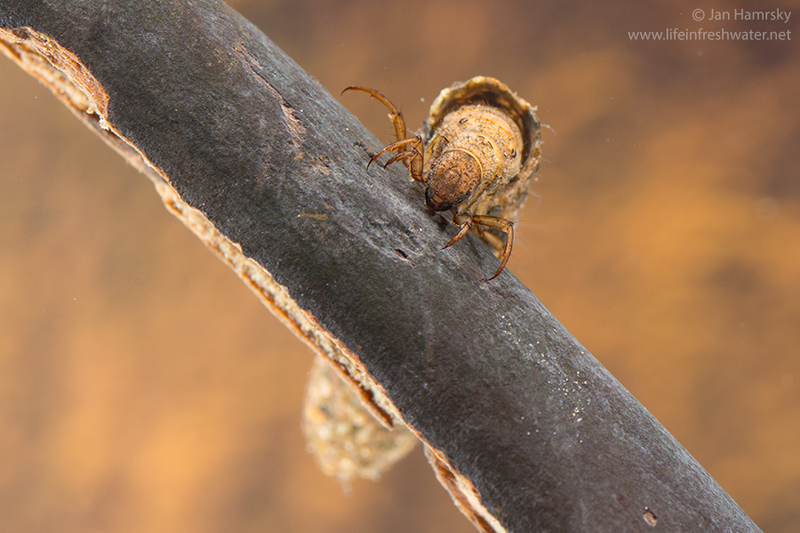 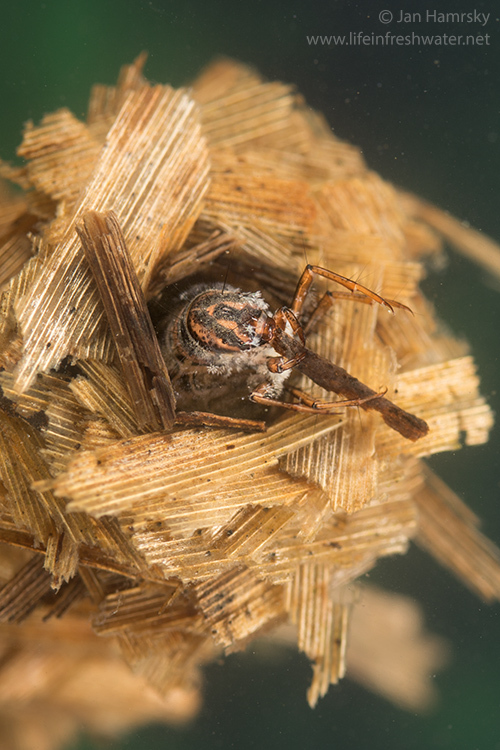 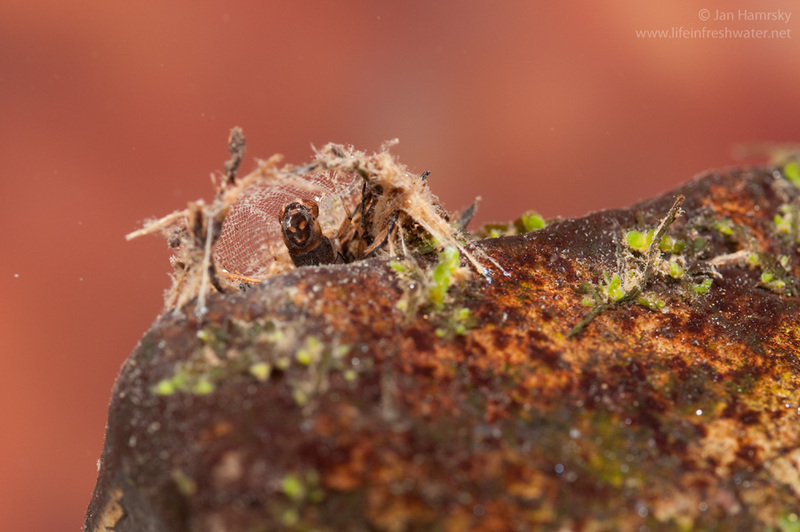 Case-building caddisfly larvae use the silk to construct various portable shelters. 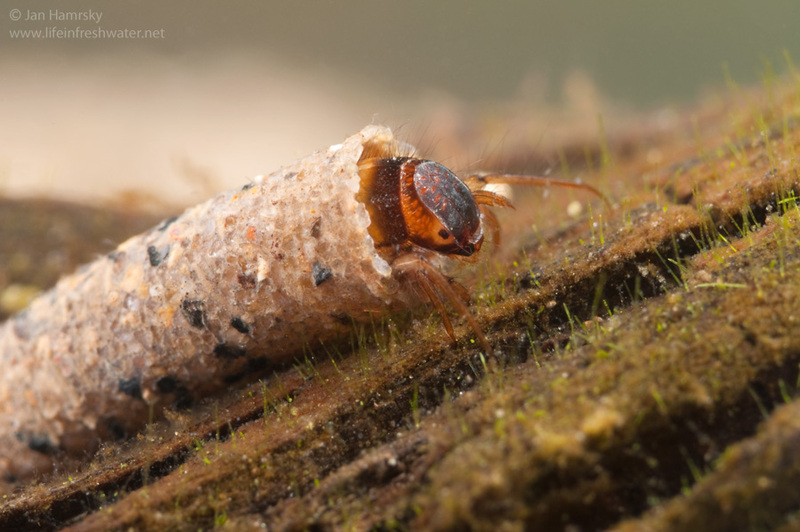 They protect soft abdomen from predators and abrasion from coarse particles drifting in stream. 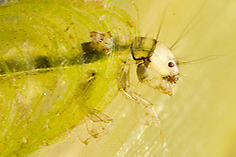 If disturbed, larva can retreat into the case, which is constantly being repaired when damaged, or rebuilt as the larva grows. 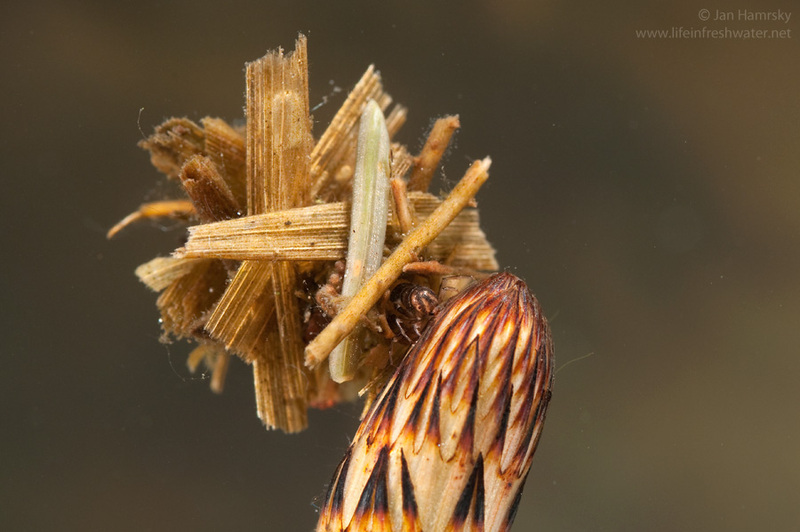 Cases come in large variety of shapes and structures. 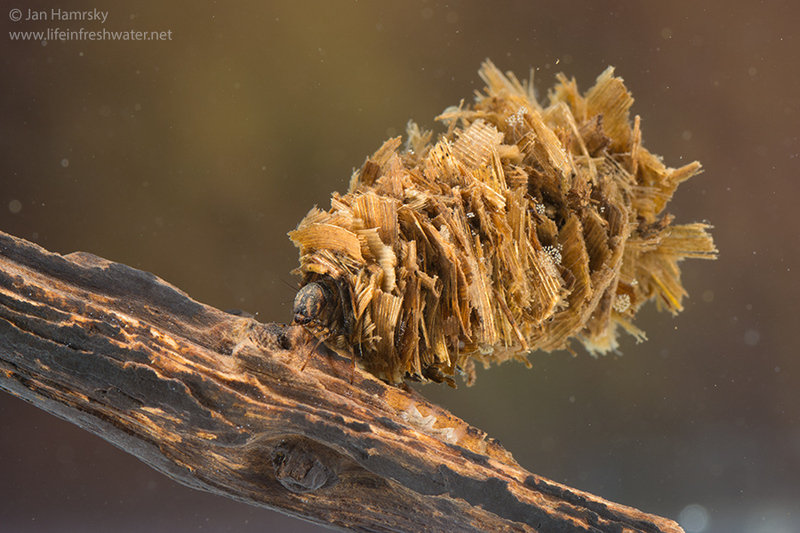 They are made of silk and vide range of materials (some are made exclusively of silk). 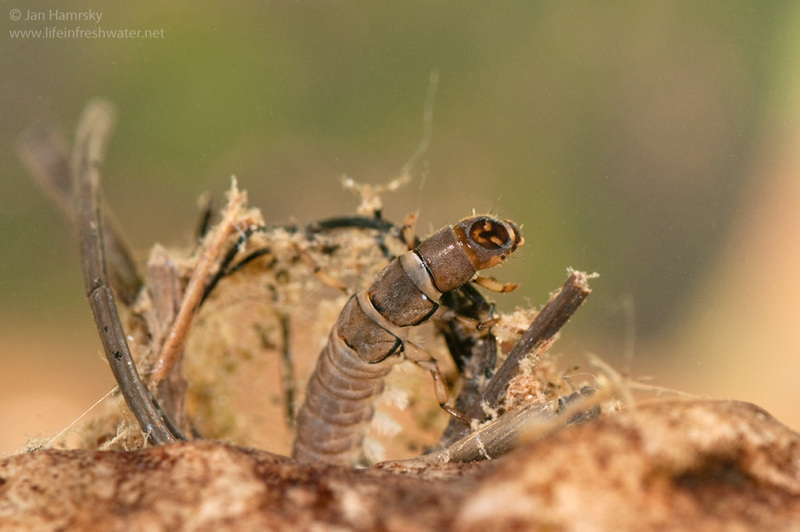 Used construction material can be important for identification, although some larvae change it as they grow, or as seasonal materials become available (e.g. 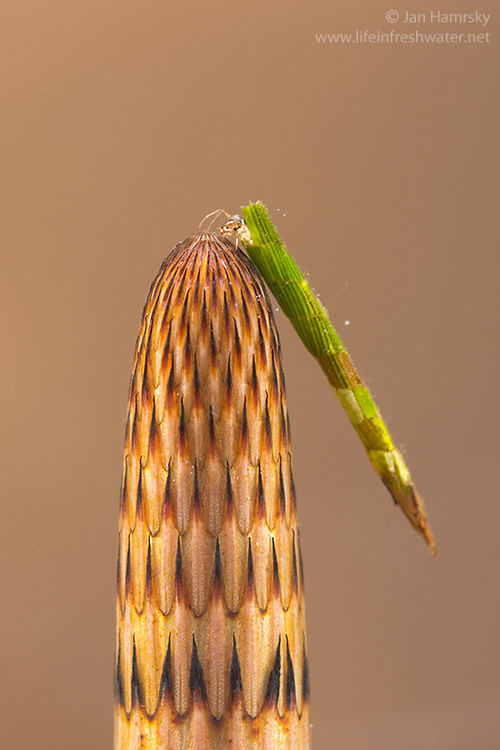 seeds of terrestrial plants or snail shells). 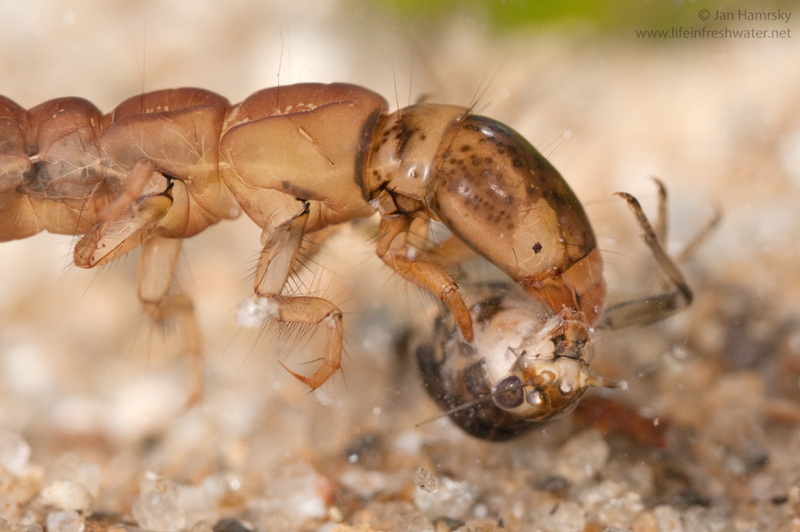 Last but not least, some large species can incorporate cases of other smaller species into their own big cases. 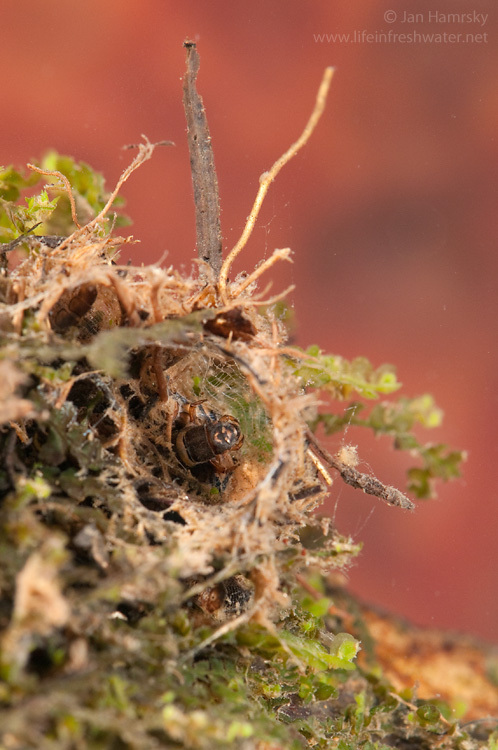 Besides availability, the choice of materials depends on the environment. 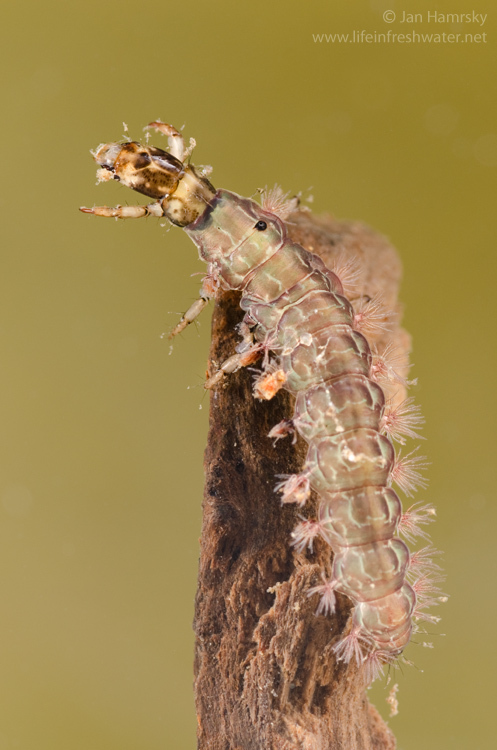 In general, larvae living in running water use heavier components to increase their overall weight. 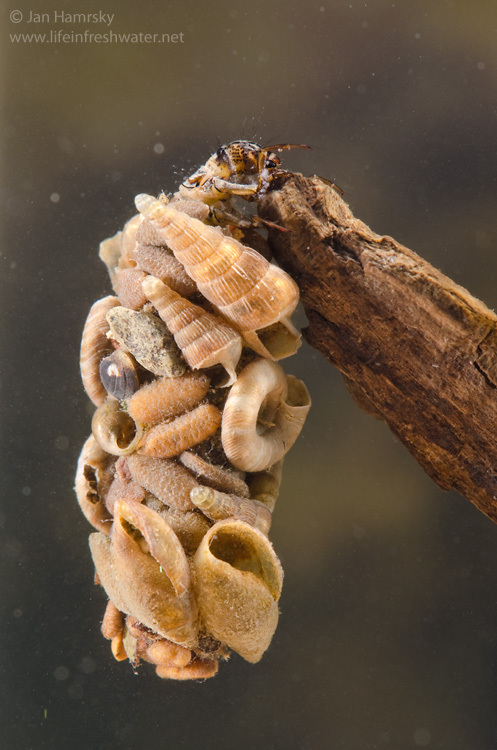 It helps them when moving in the current, or even prevents from being washed downstream. 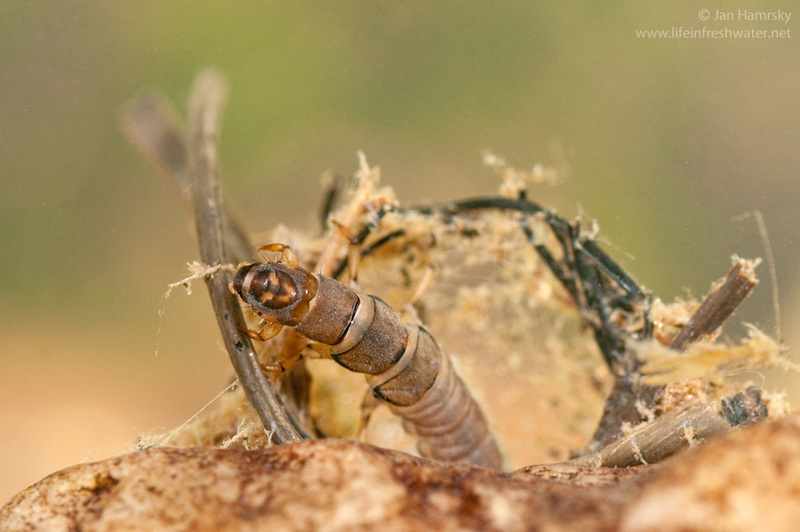 On the other hand, the larvae inhabiting still water tend to build their cases of lightweight materials. 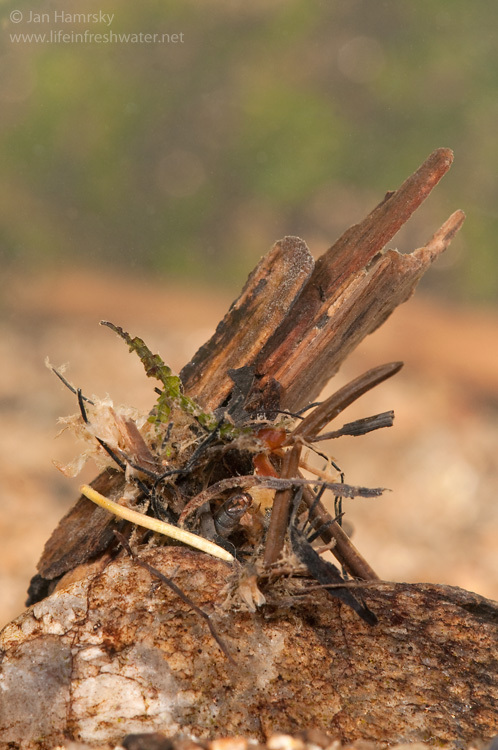 They use various parts of living or death vegetation such as twigs, stems, leaves, needles or pieces of bark. 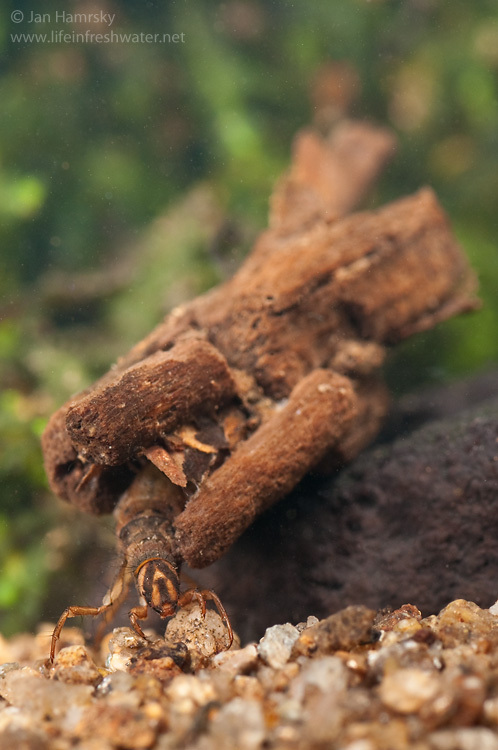 Some aquatic plants developed modification involving the use of air chambers in the leaves (in order to be held in vertical position). 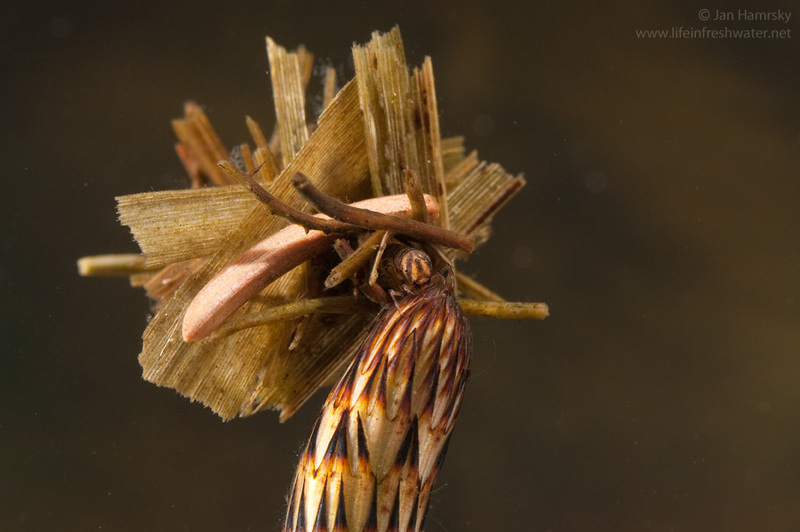 Some caddisfly larvae cut these leaves and use them to build floating cases. 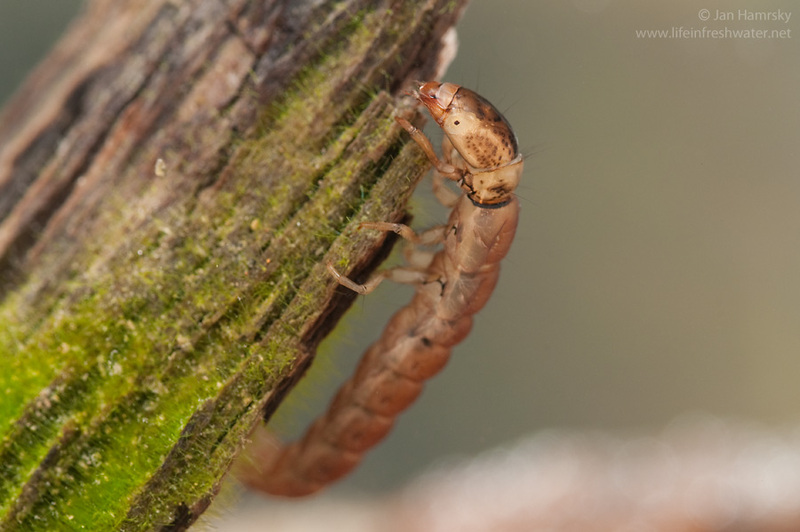 Larvae are sensitive to pollution and for this reason are used worldwide as the indicators of water quality. 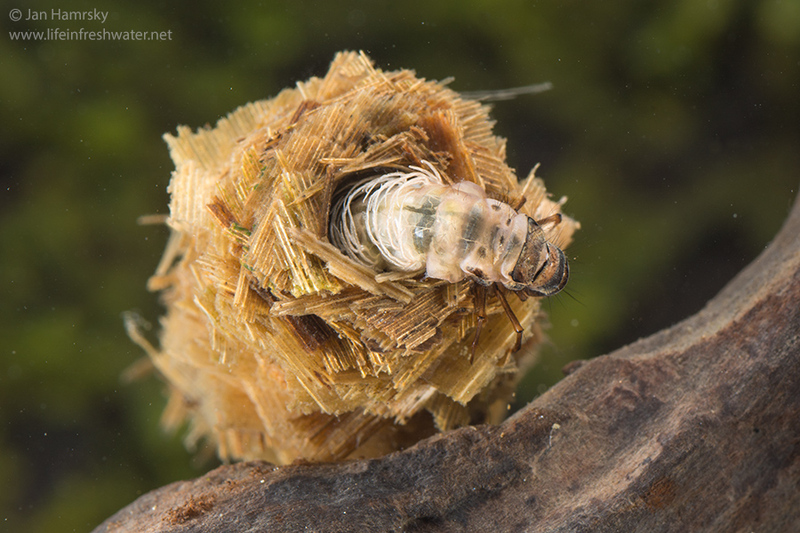 Collectors/filterers – omnivorous larvae feed on algae, detritus and small invertebrates that get caught in the net. 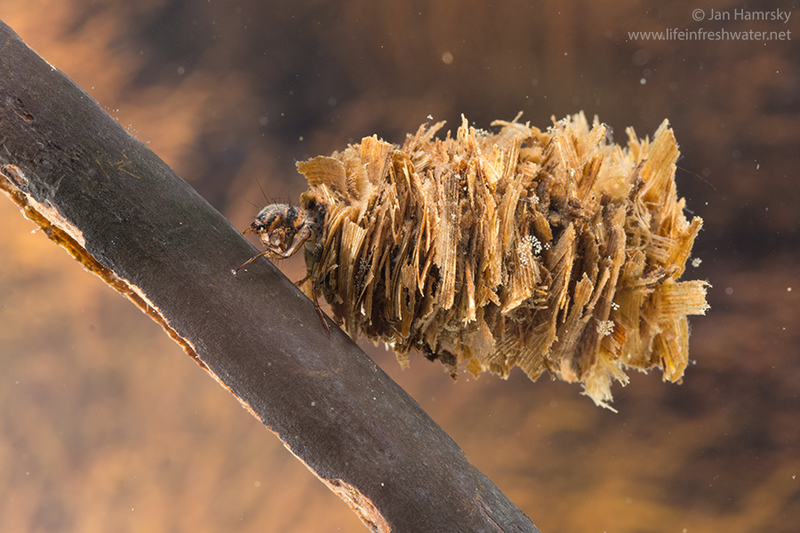 Net-spinning larvae are common and abundant in running waters of streams and rivers. 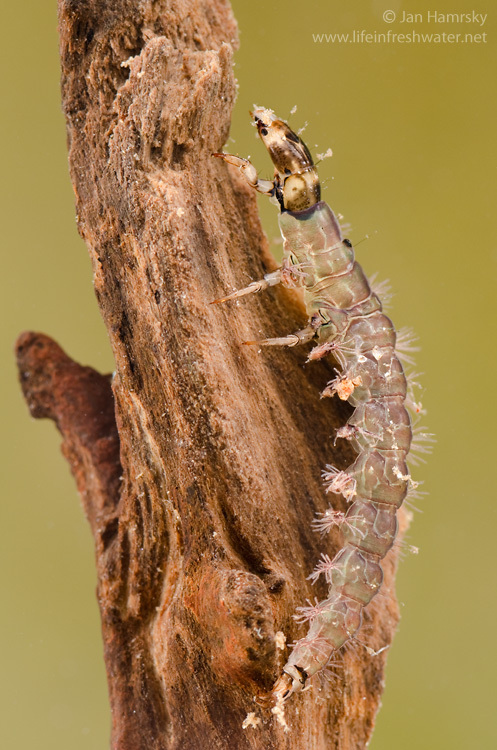 Clingers/crawlers – larvae spend most of the time in retreats, where they check a haul in the net. 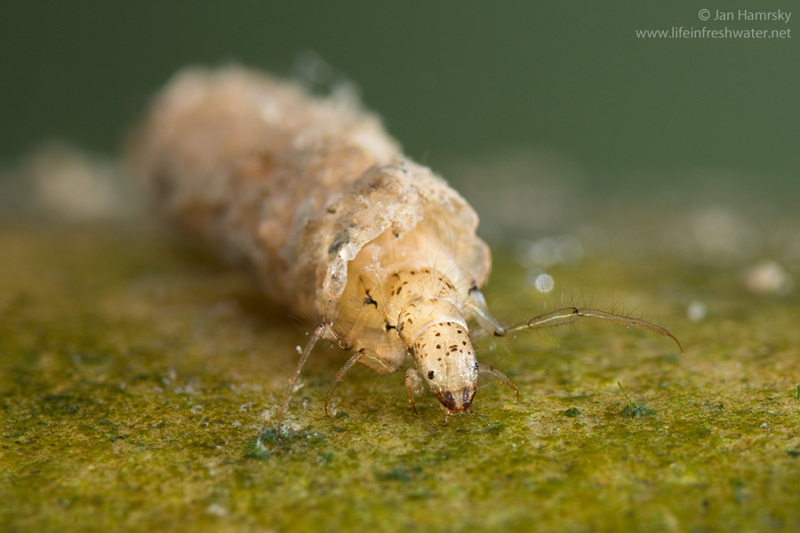 Mature larvae can grow up to sizes around 20 mm (fixed shelters may be huge in comparison to the size of the larvae). 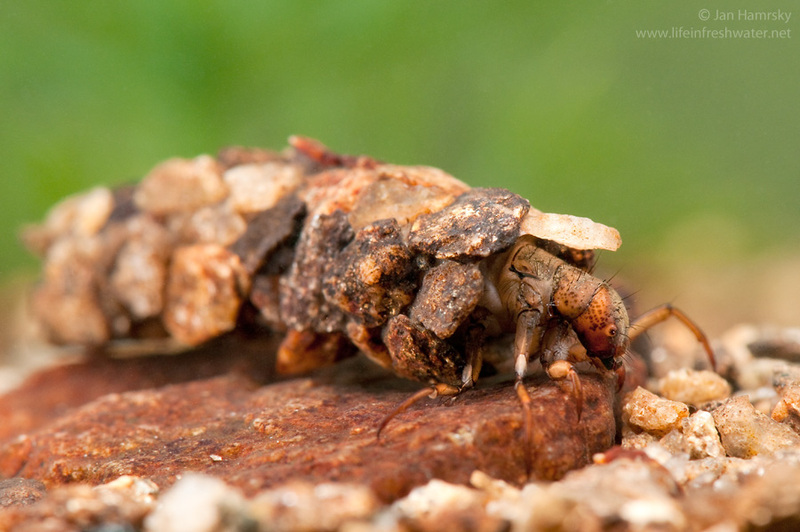 Caddisflies undergo complete metamorphosis. 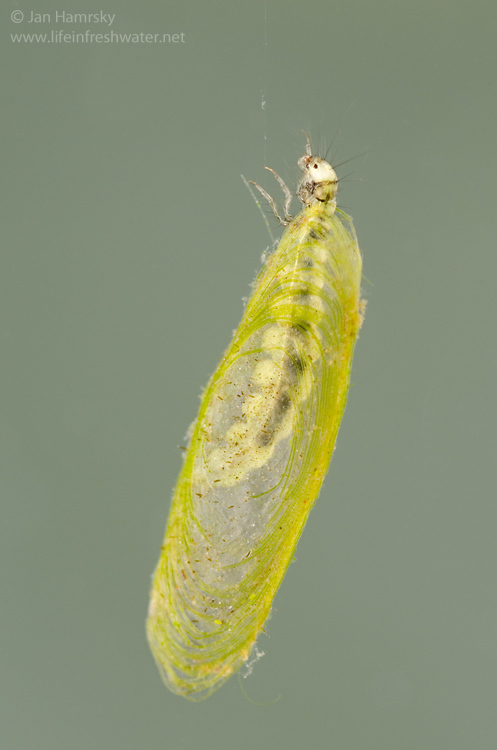 Their life cycle includes four stages – egg, larva, pupa and adult. 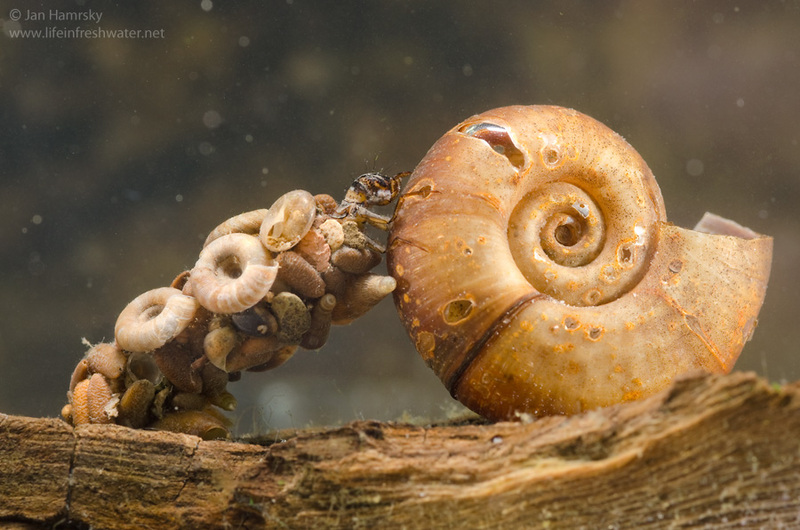 Most species produce one or two generations per year. 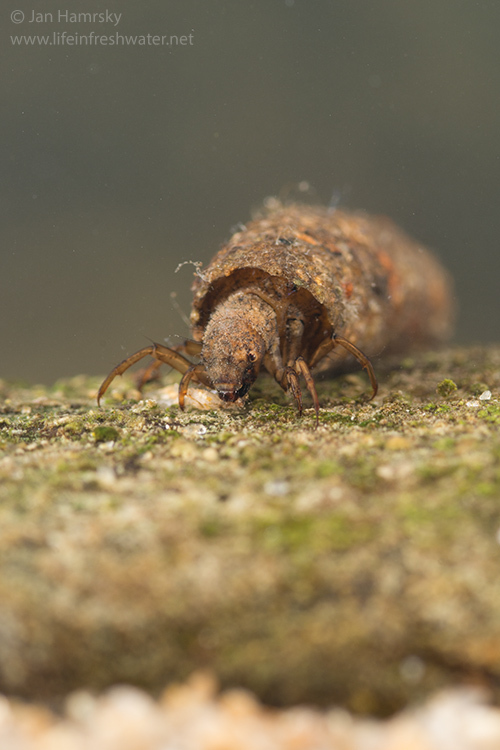 Net-spinning larvae are among the most abundant caddisfly larvae in running waters. 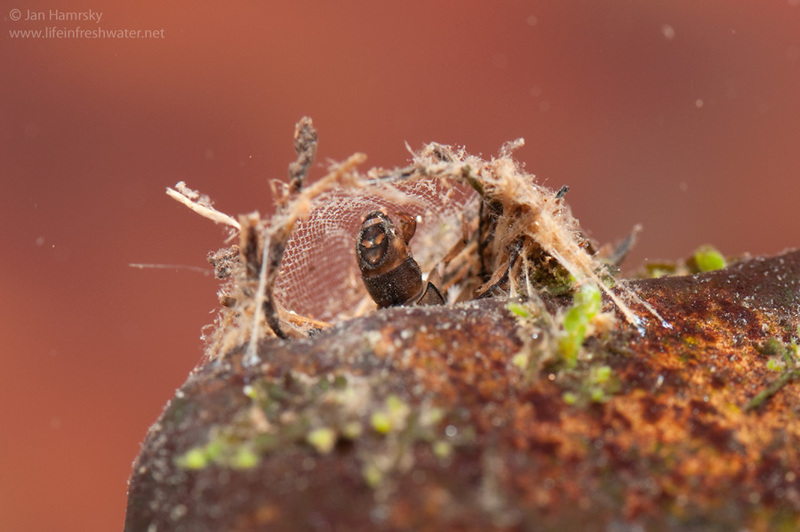 Abdomen is lined with obvious tufts of branched gills and ends with well developed prolegs. 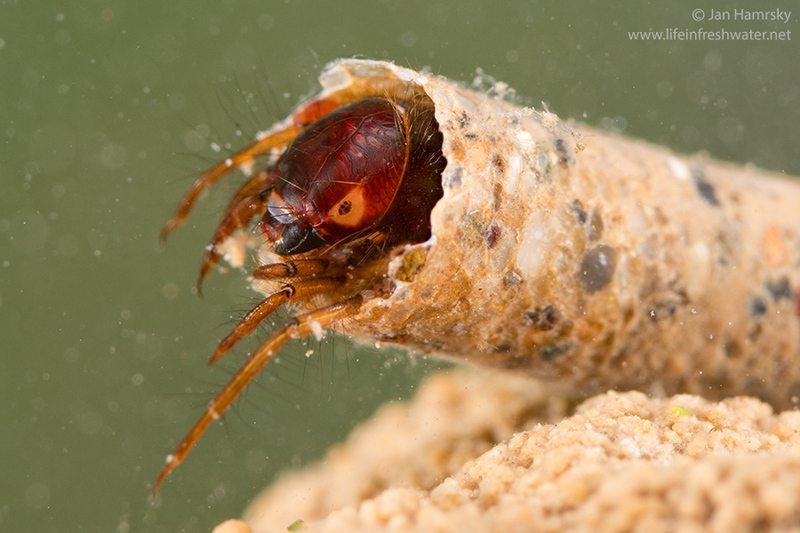 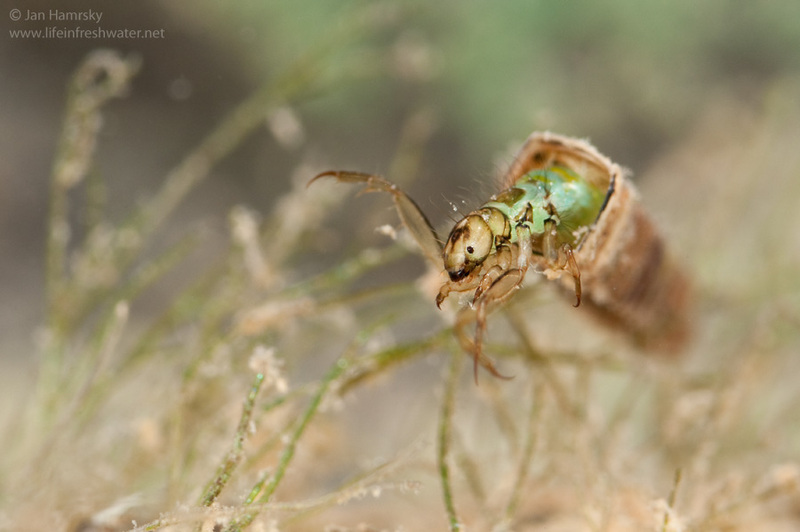 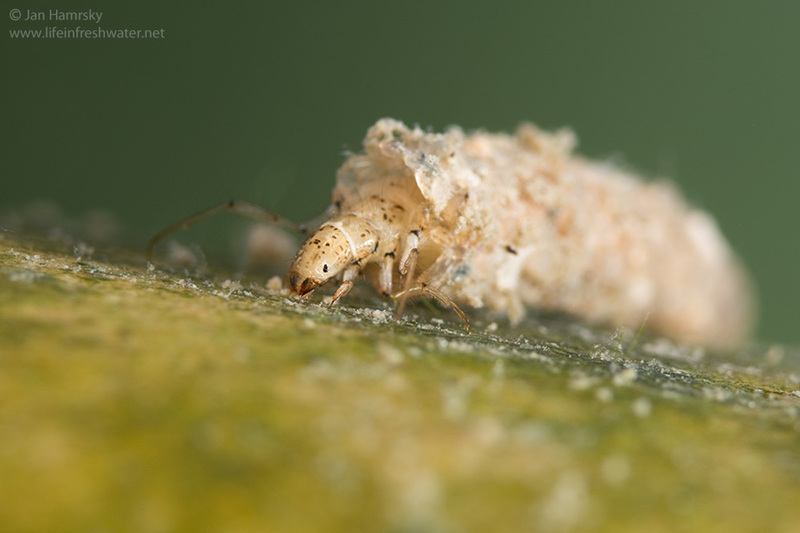 Prolegs are equipped with claws used to hold the larvae inside the retreat or on the substrate when crawling around. 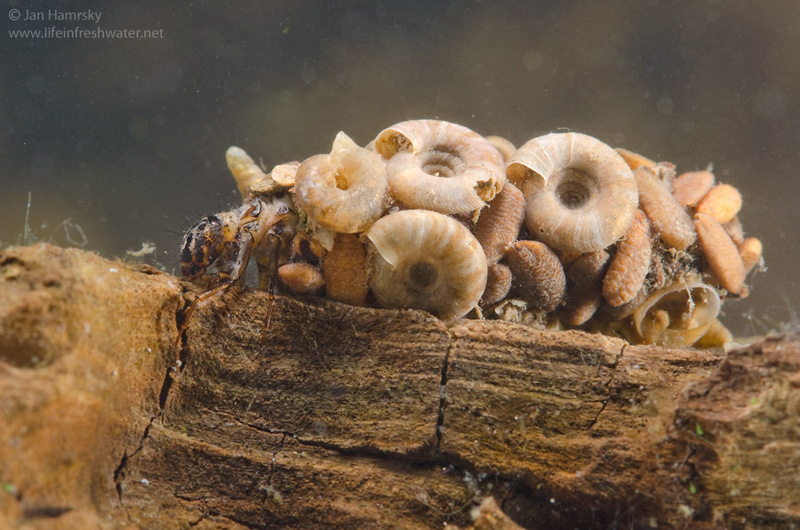 All three thoracic segments are covered with sclerotized plates. 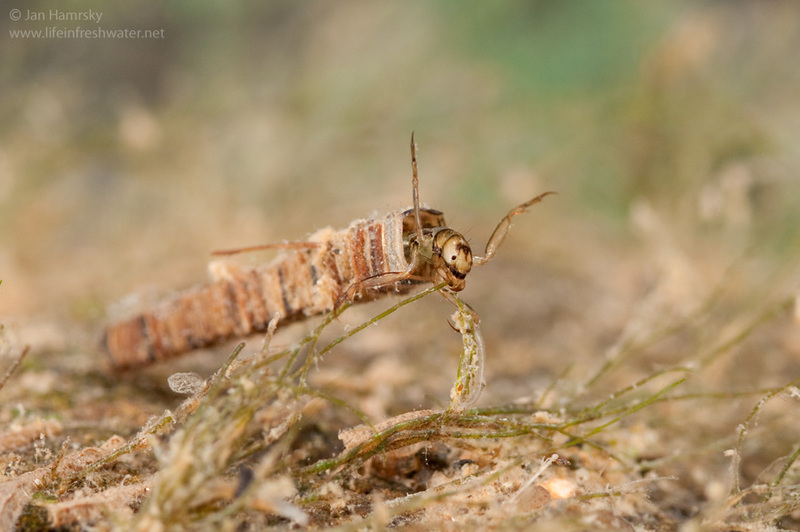 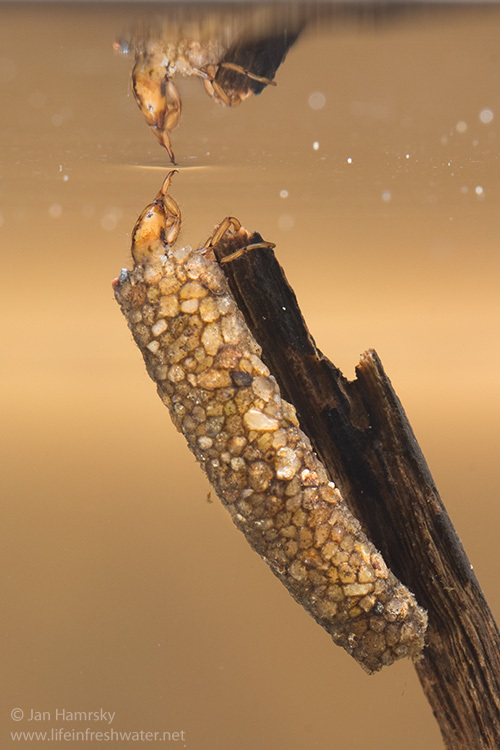 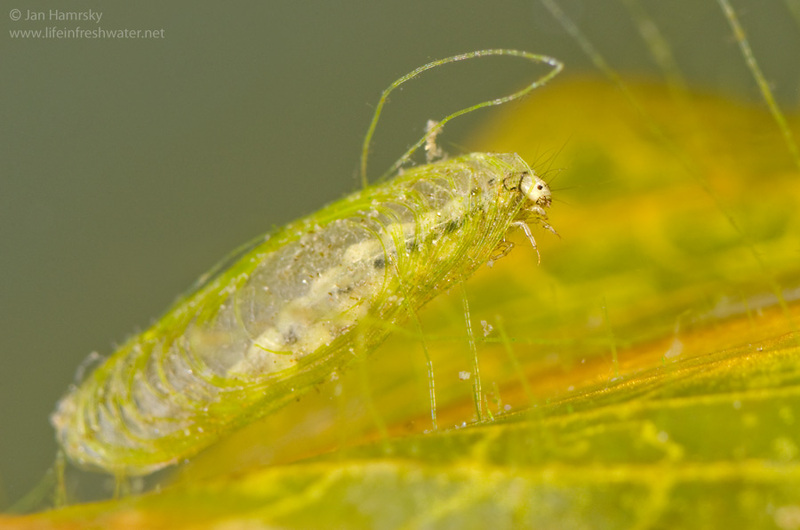 Net-spinning caddisfly larvae construct fixed retreats of both organic and inorganic materials. 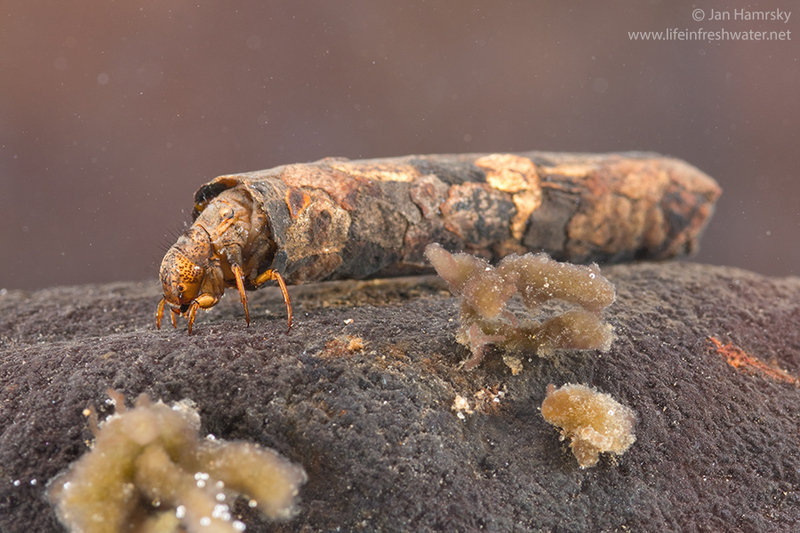 The most common places where the larvae build their shelters are on the rocks and in the clefts between the stones. 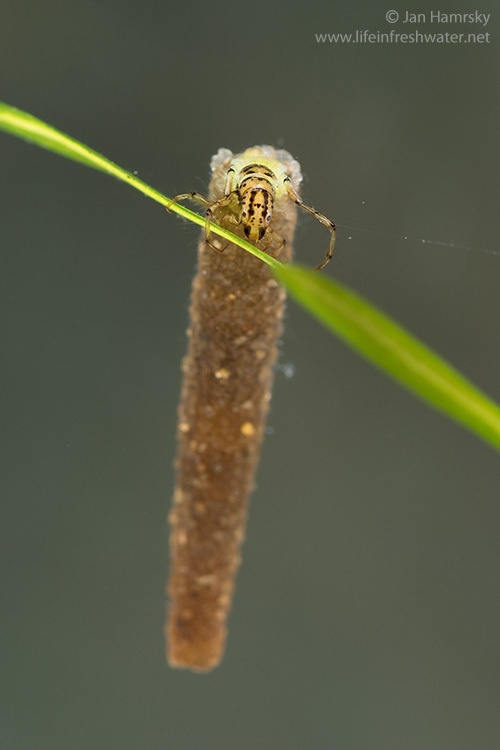 However, they are abundant on roots and in tangles of aquatic plants as well. 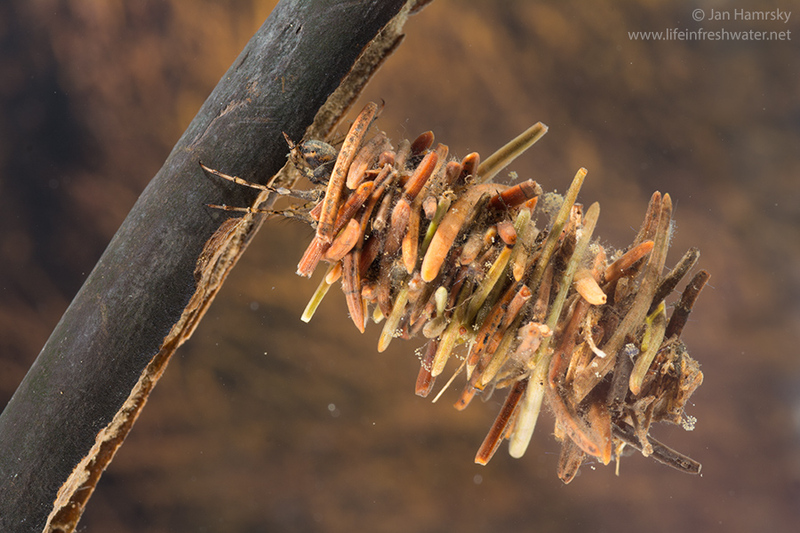 The constructions are spliced together and glued down to the substrate by a silken thread. 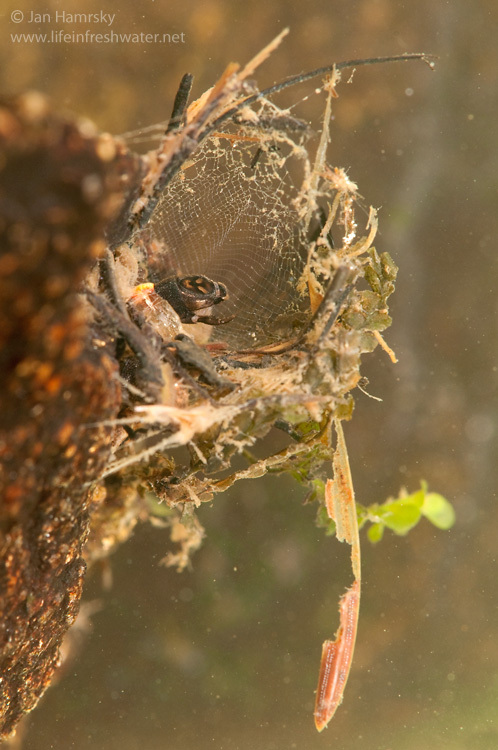 Retreats are equipped with trapping nets, positioned perpendicular to the current, in order to capture organic particles and even small animals drifting in a stream. 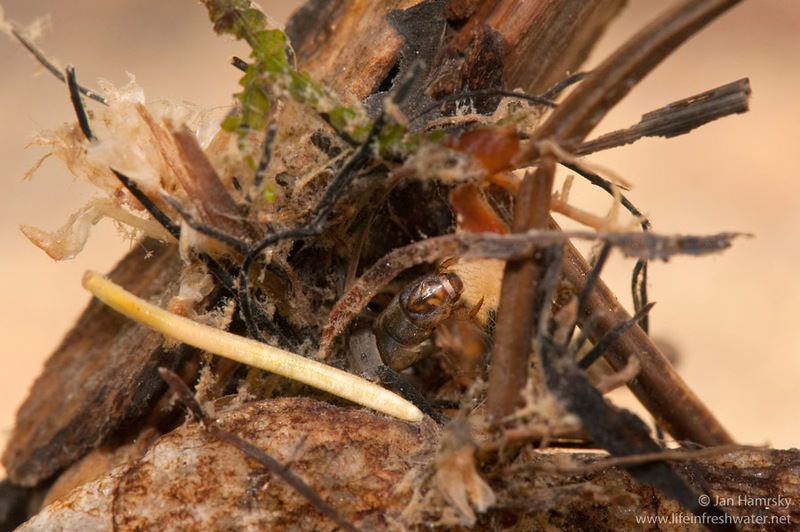 The net, which is stretched across the plant stems, stones, or arms constructed by the larvae, can be in the form of extension of the shelter or placed aside. 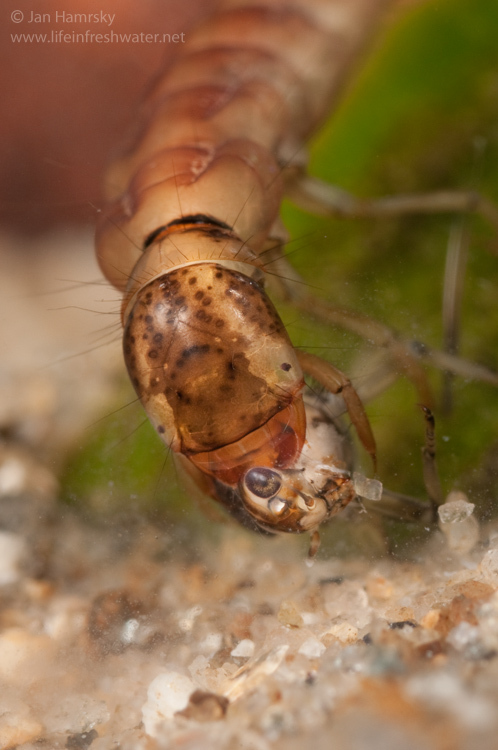 Larvae continuously clean their nets by picking off inorganic pieces and consuming organic matter. 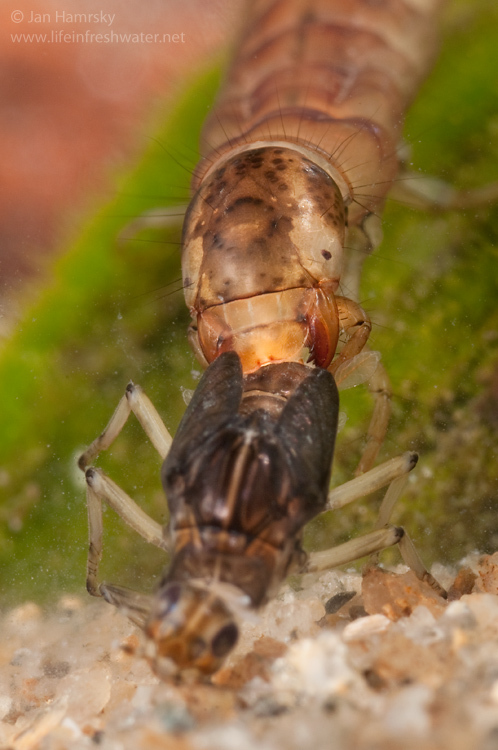 This behavior increases filtering and capturing efficiency of the net. 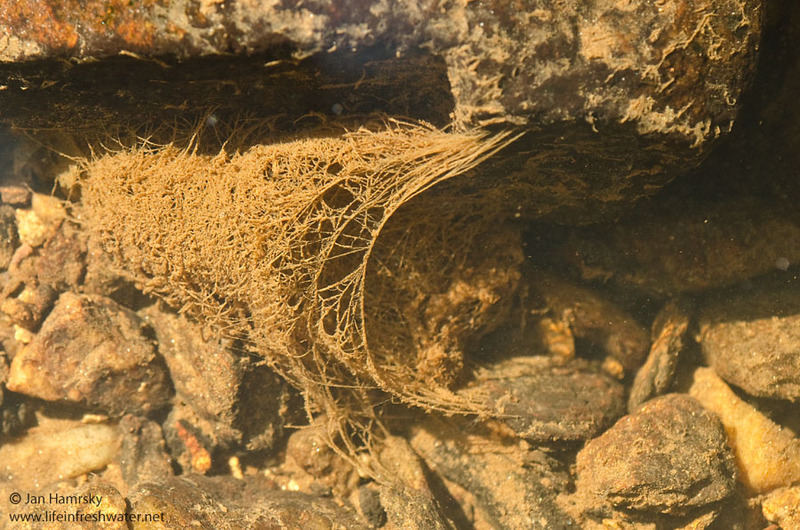 Mesh size and diameter of the net varies among the species and equally as the speed of the current, influence the amount of filtered water. 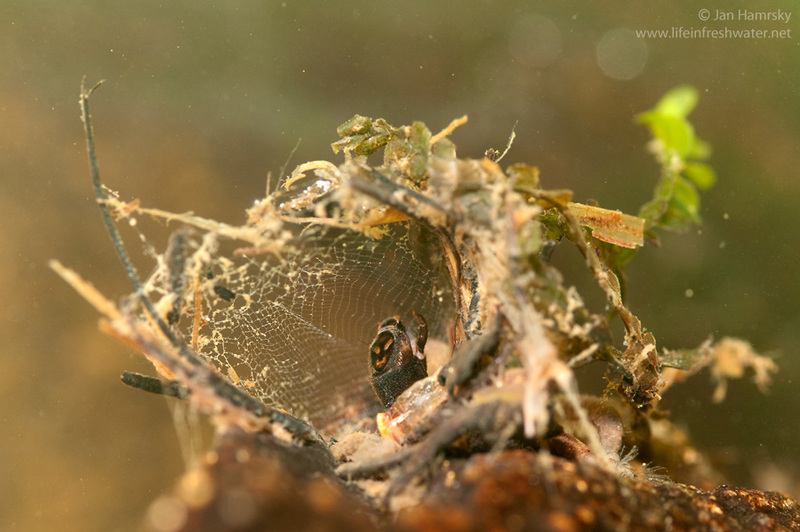 Consequently, species depending on algae use smaller mesh size than the species specializing on animal prey. 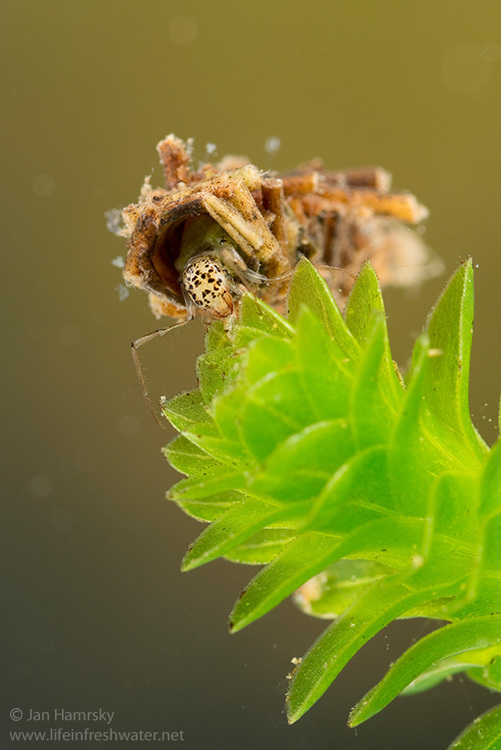 Net-spinning larvae are apparently territorial and defend space around their retreats from other competitors. 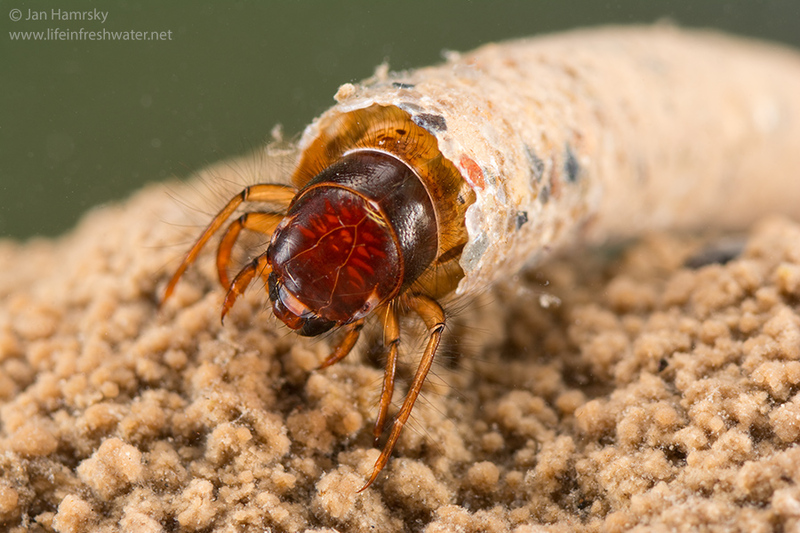 When the larvae are fully grown and ready to pupate, they fortify the retreats with additional material and seal the entrance. 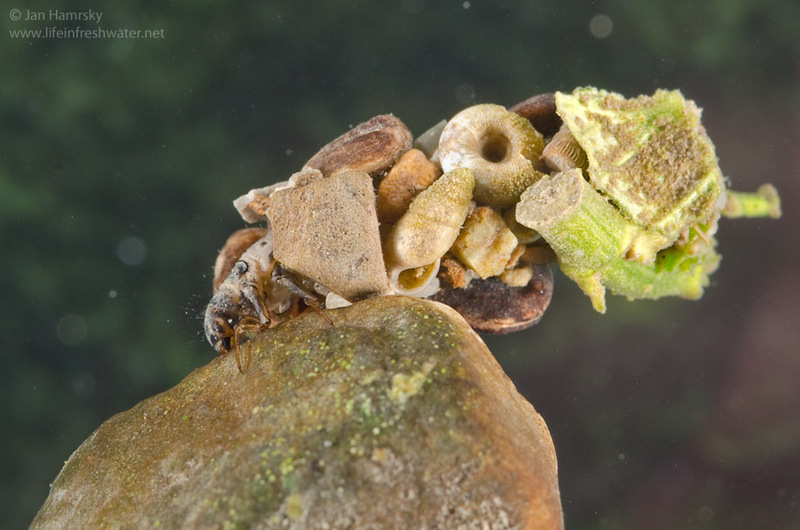 Larvae of some species move under the rocks, where they build solid shelters of sand and stones to protect the transforming pupae. 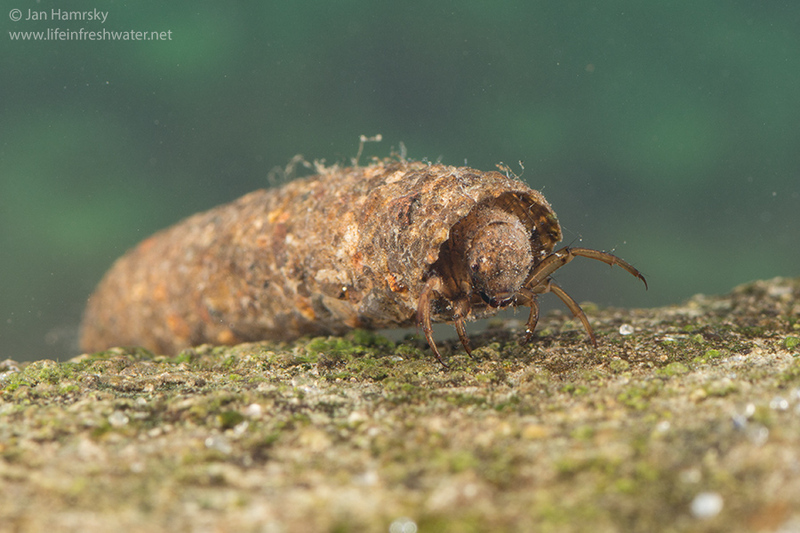 Filterers/predators – larvae feed on organic debris and invertebrates that get caught in the net. 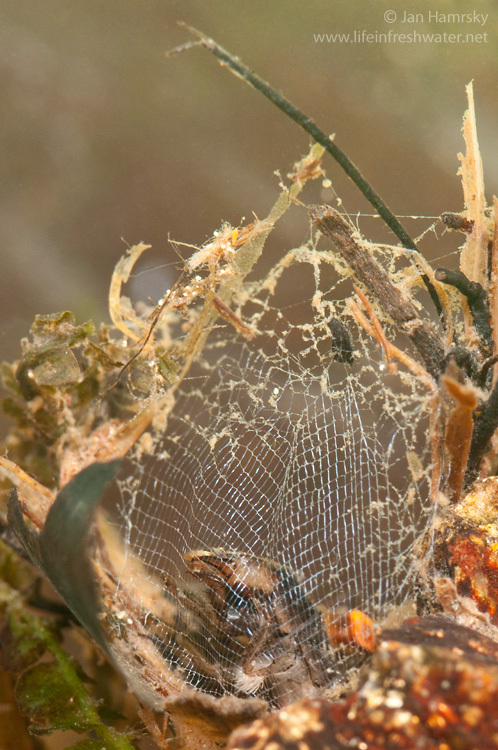 Net may be equipped with silken threads extending the entrance. 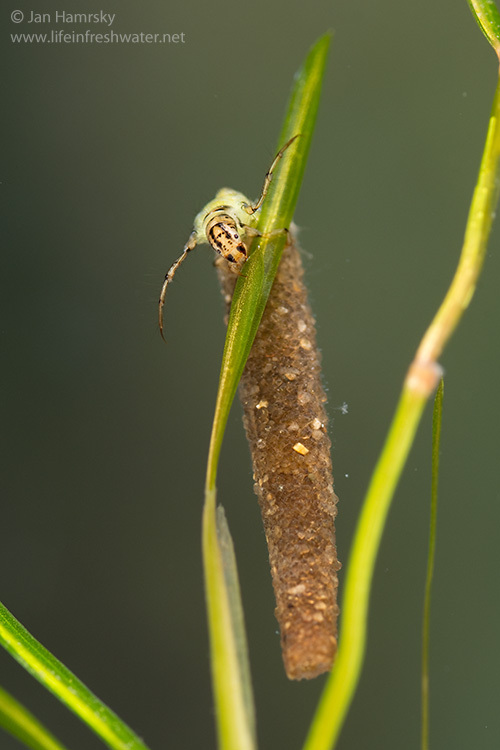 When a passing prey touches the threads, larva grabs it in the similar way as spiders do. 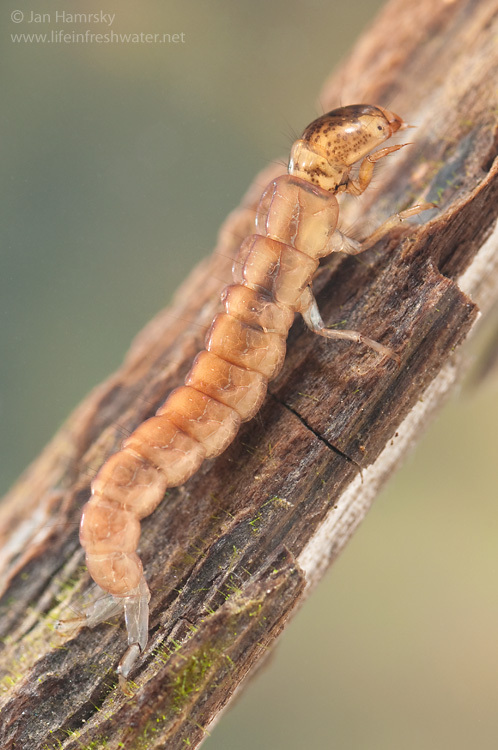 Larvae are common and abundant in slow flowing parts of streams and rivers. 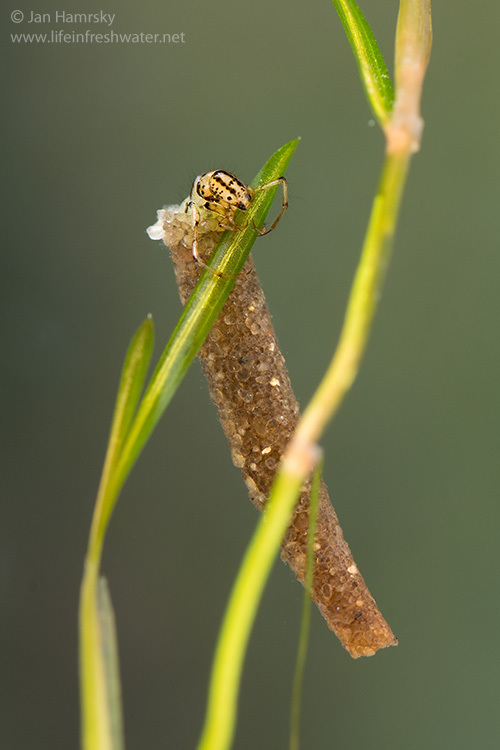 Clingers which spend most of the time in fixed nets where wait for a prey. 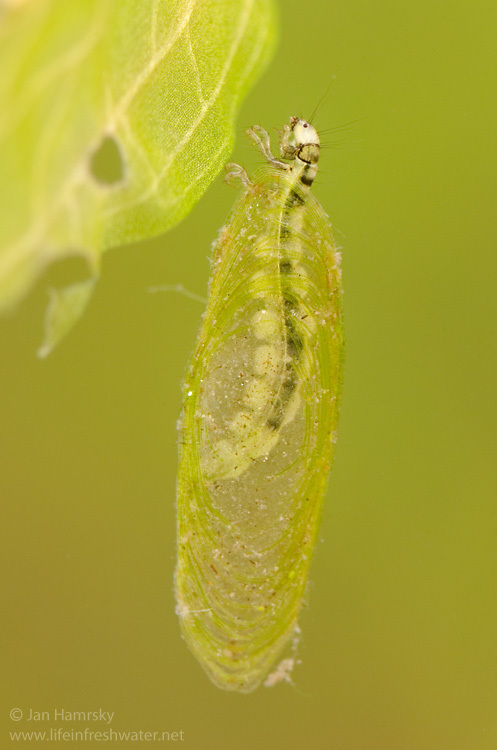 Mature larvae can grow up to sizes around 25 mm (fixed nets may be huge in comparison to the size of the larvae). 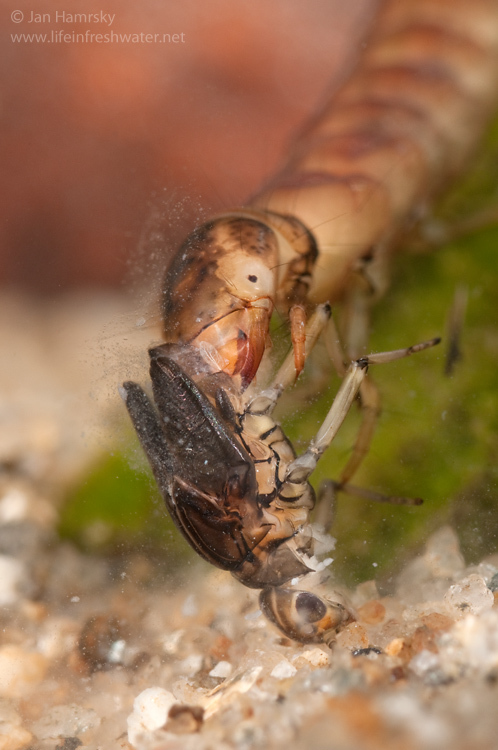 Predators feeding on various insect larvae and other small invertebrates. 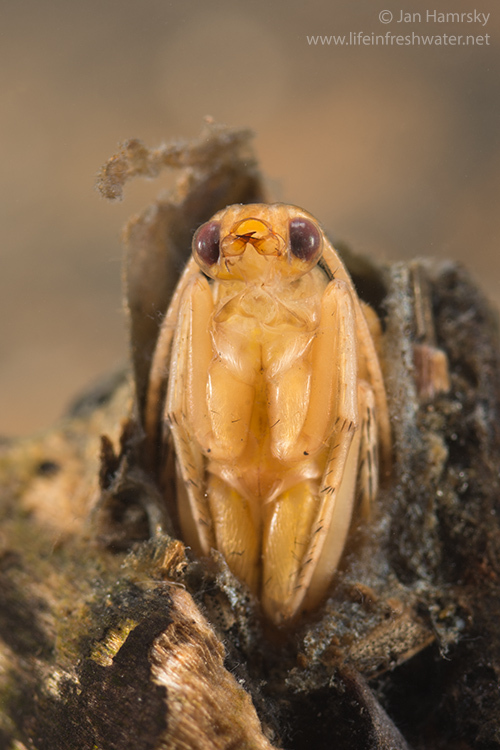 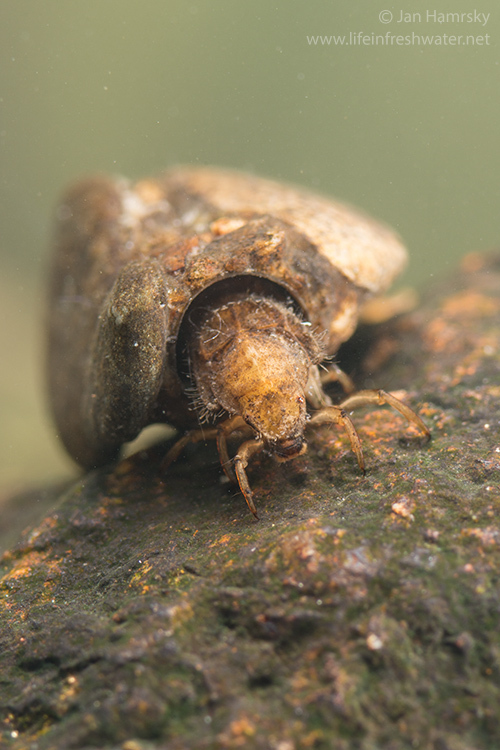 Most species of free-living caddisflies are very sensitive to pollution and level of dissolved oxygen. 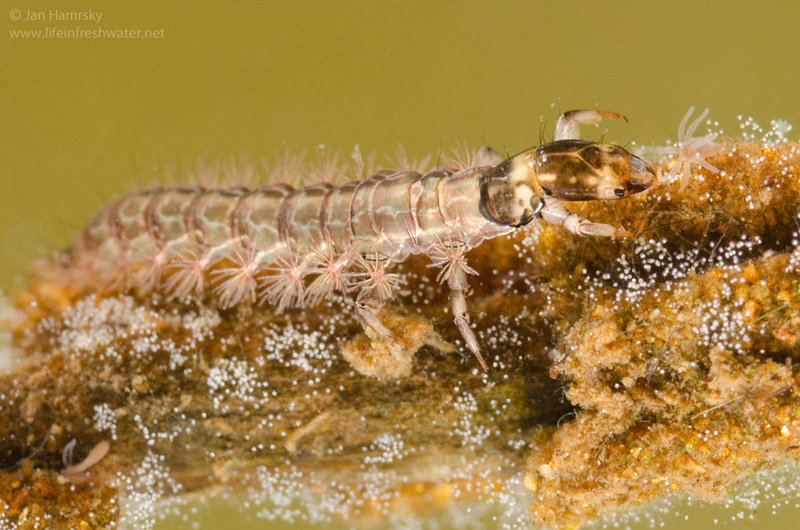 Accordingly, larvae live in the fastest sections of clean rivers and streams. 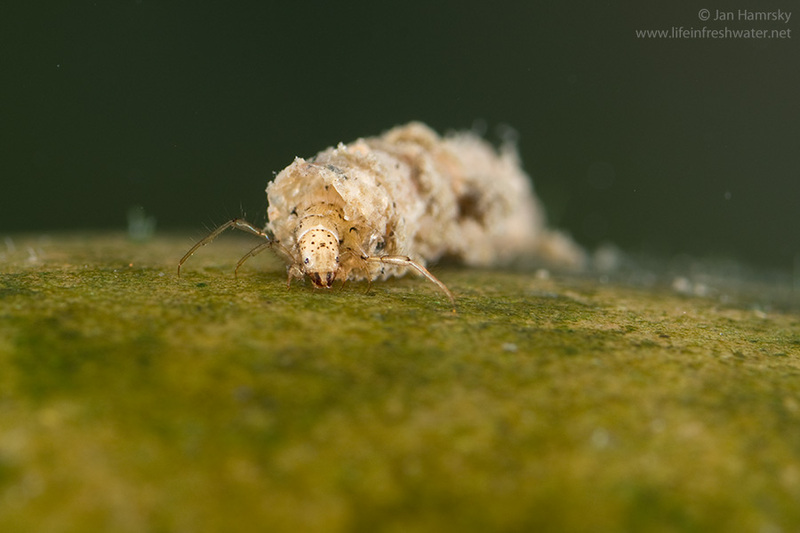 Larvae crawl among the stones and sediments, or lurk for a prey in clumps of moss and algae. 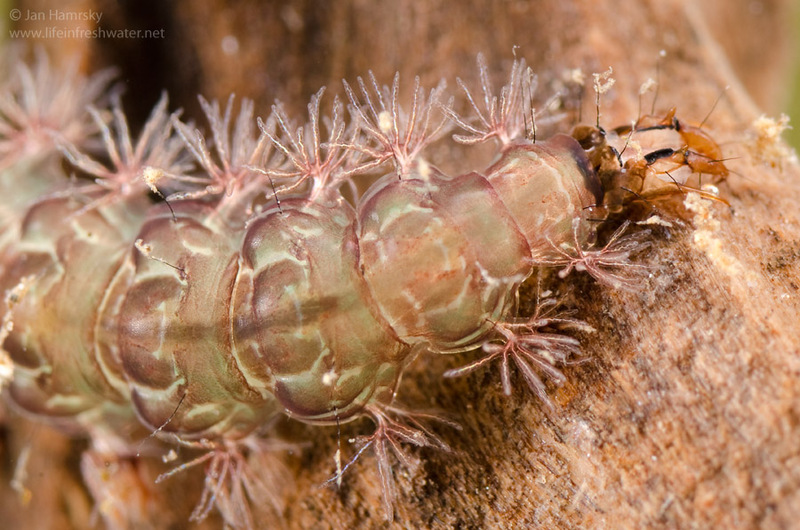 While moving, larvae spin silken thread, which helps them to maintain in the current. 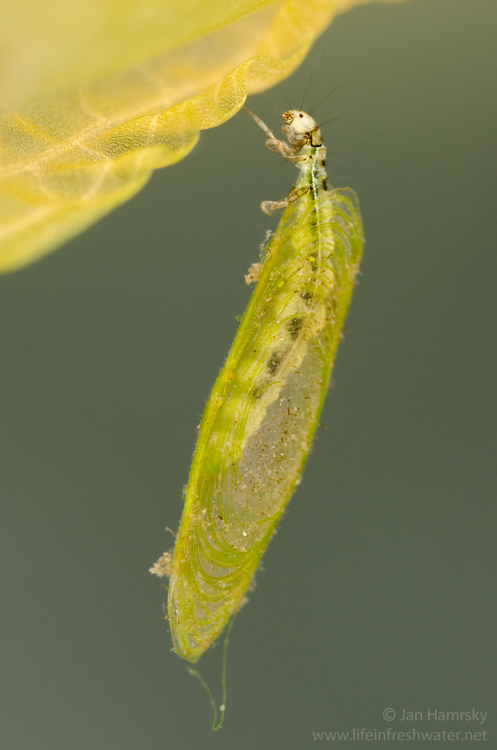 Mature larvae can grow up to sizes around 30 mm. 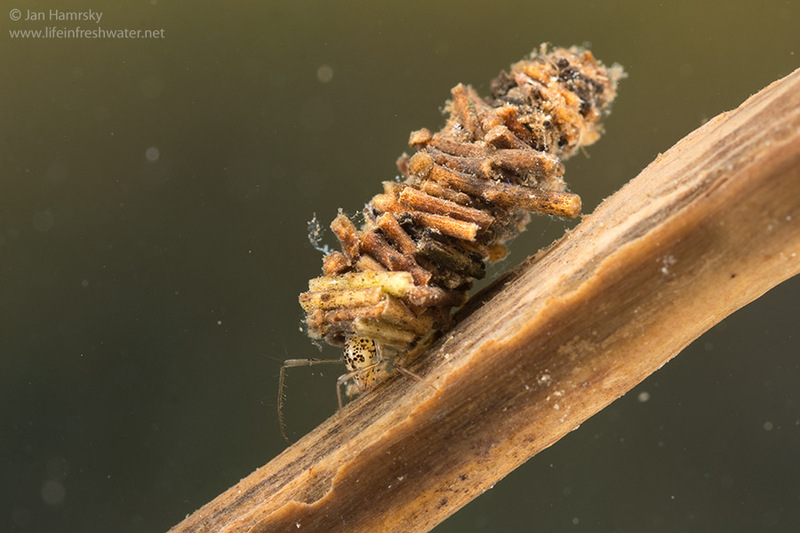 Larvae do not live in protective cases or retreats, but like other caddisfly larvae, they build protective structures for the pupae.